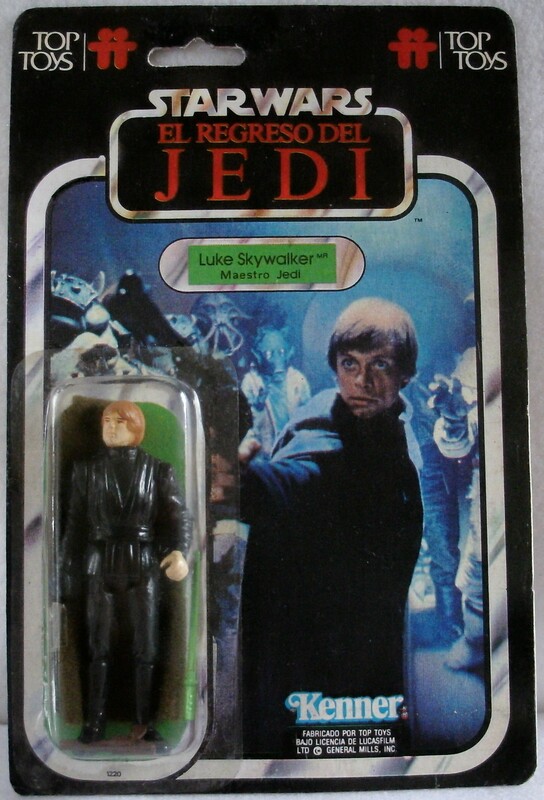 The Argentinian licensee Top Toys was responsible for releasing a limited run of seven Star Wars action figures during 1983 under the title of "EL REGRESO DEL JEDI" the Spanish for "RETURN OF THE JEDI". 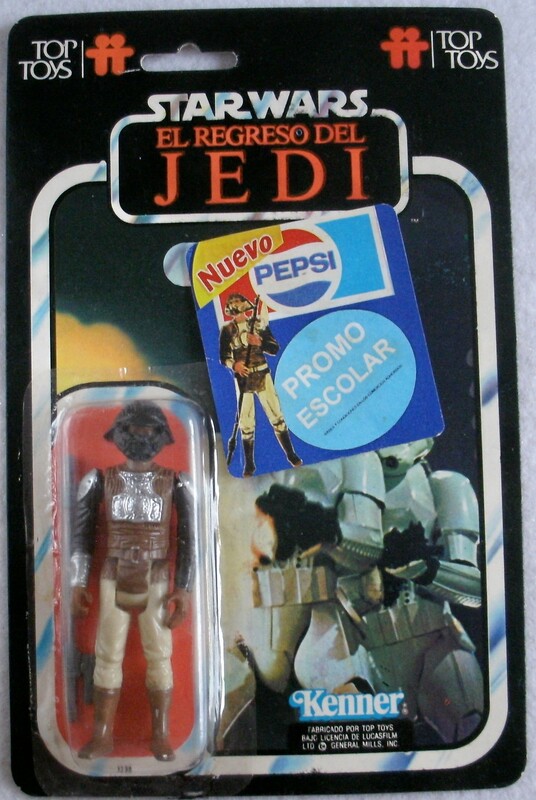 Evidence from surviving pre-production materials show that Top Toys had originally planned to extend their range to include two addition figures, Lando Calrissian in Skiff Guard Disguise & Boba Fett. 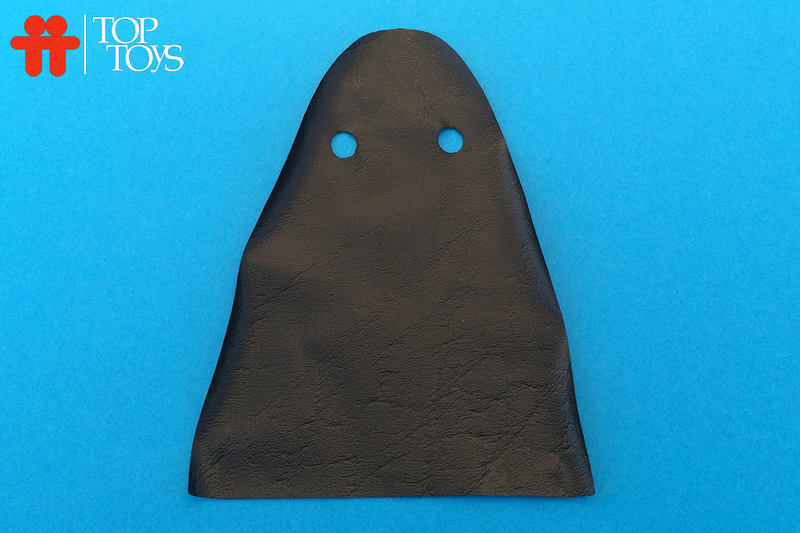 The most famous piece of pre-production material comes in the form of this presentation board below. 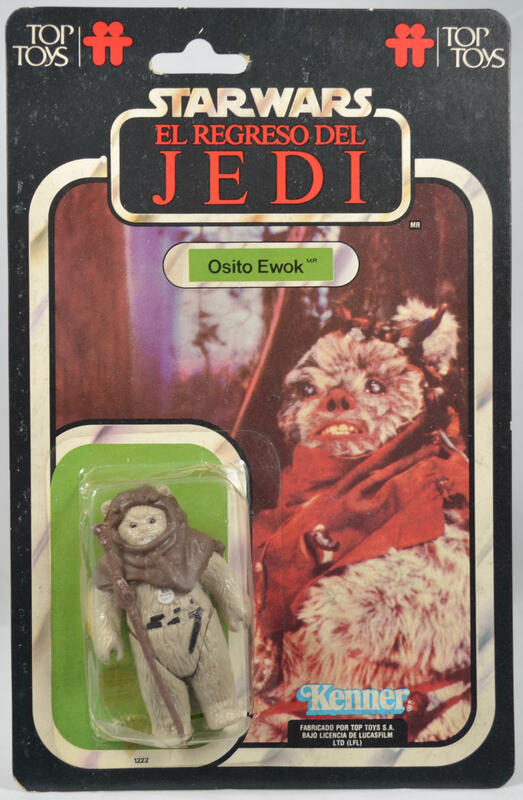 Luckily for collectors Top Toys unknowingly released one of the most interesting "licensed" vintage Star Wars figure lines because unlike other foreign licensees Top Toys opted to make there own molds. 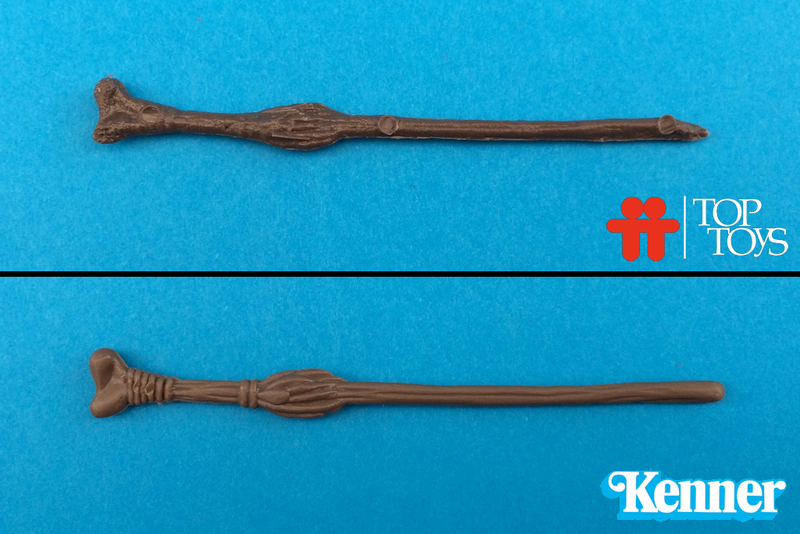 The exact reason for this is unknown but it's speculated that due to cost implications Top Toys decided to manufacture their own moulds. 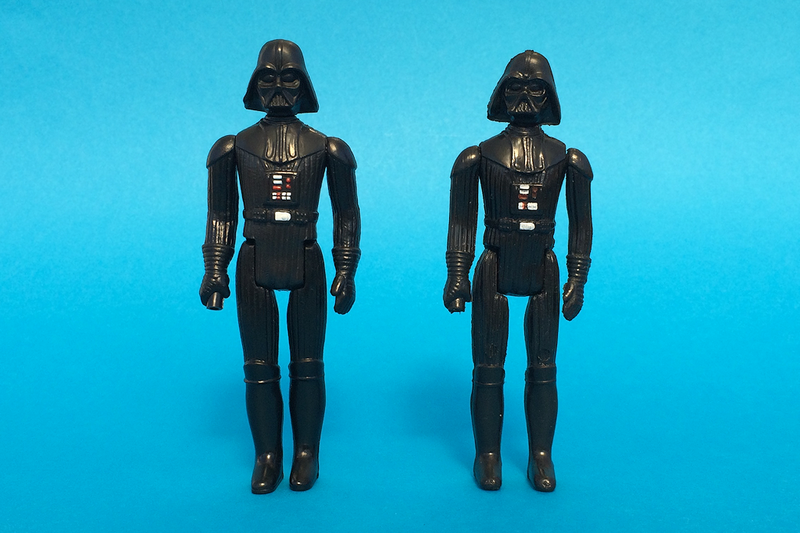 However, unlike any of the other factories producing Star Wars toys, they did not use the original wax sculpts or hardcopies. 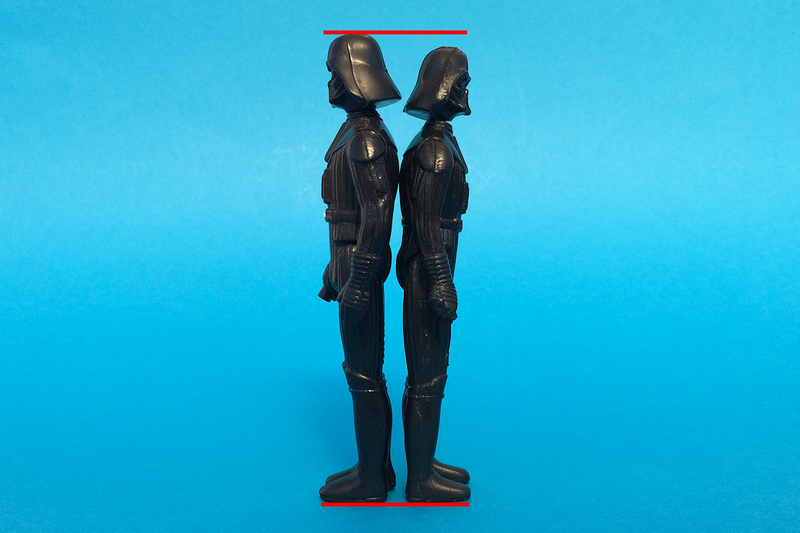 They choose instead to use Kenner production figures which resulted in the Top Toys figures being slightly smaller due to shrinkage during the manufacturing process. 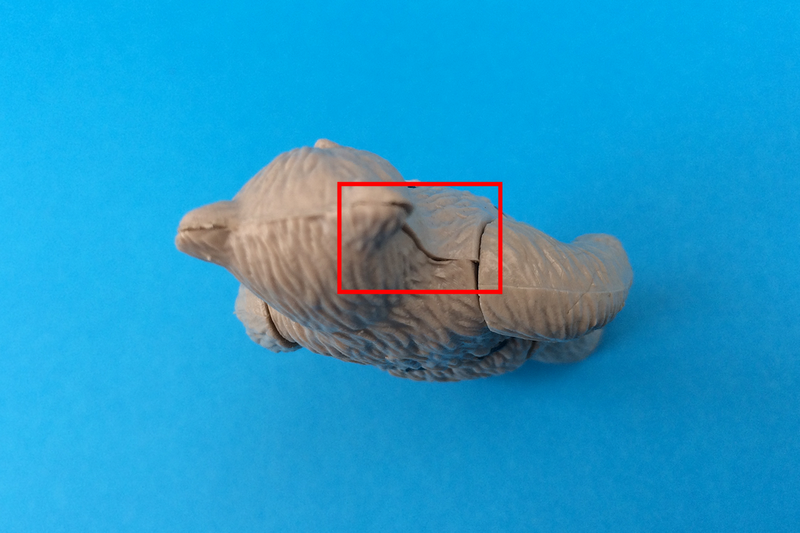 Another known difference due to this method of manufacture is a loss of detail in the sculpt. 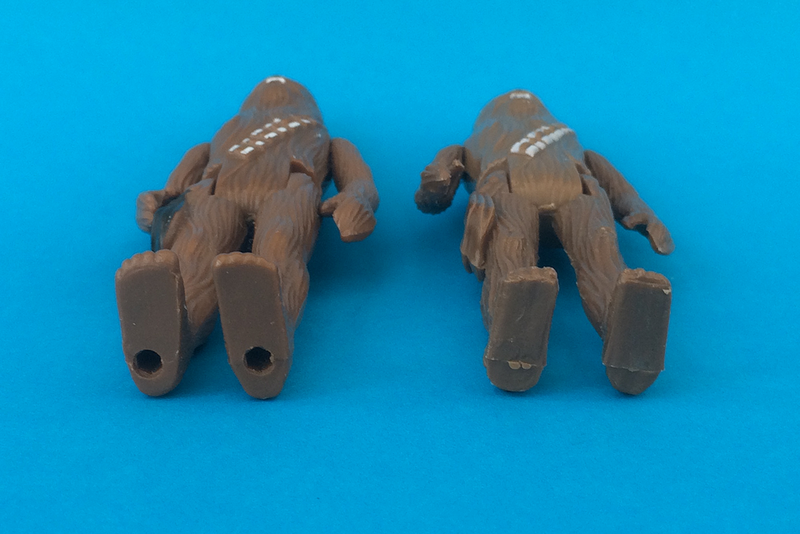 Regarding the accessories, several of the figures in the Top Toys range came with 3 to 4 items resulting in alot incomplete figures surfacing on the second hand market leaving collectors with little or no hope of tracking their missing parts. 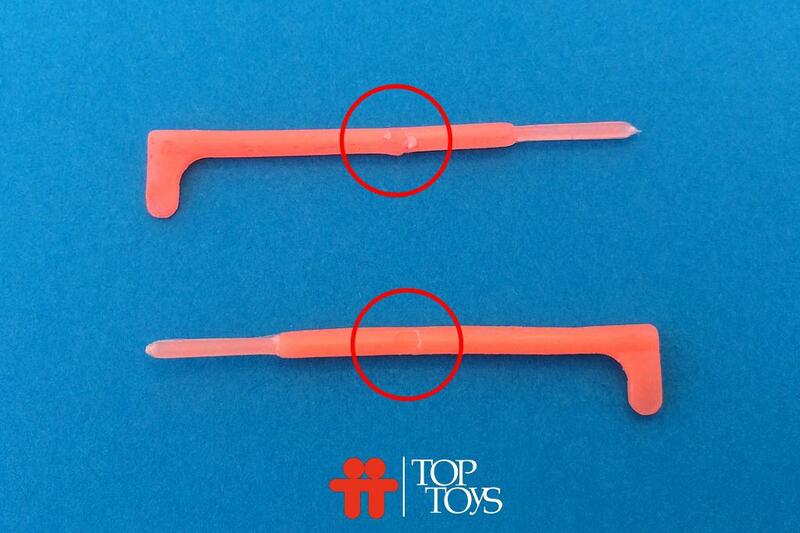 Besides the expected reason of "it was a childs toy and they lost or broke the accessories whilst playing with them", the quality of the packaging often meant that the bubbles would become unattached from the backing card by itself allowing the smaller accesories to fall out. 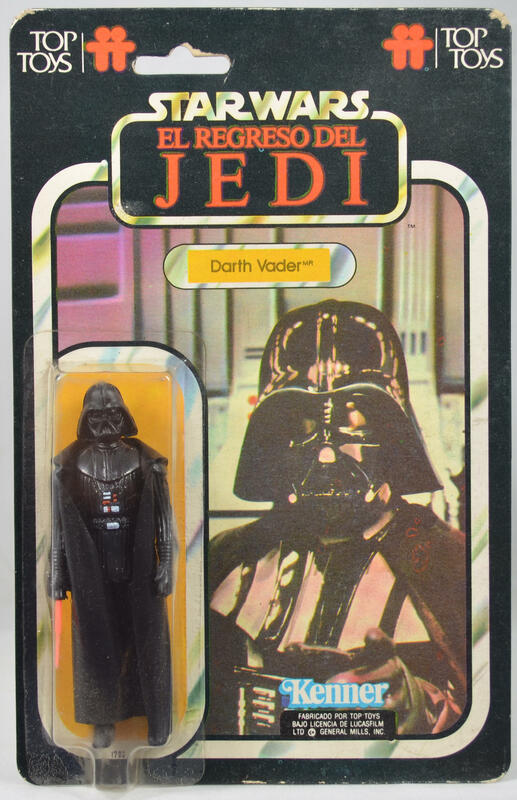 There are many examples on the second had market of bubbles stapled to card backs and card backs with the bubbles removed with hardly any noticable damage to the surrounding artwork. 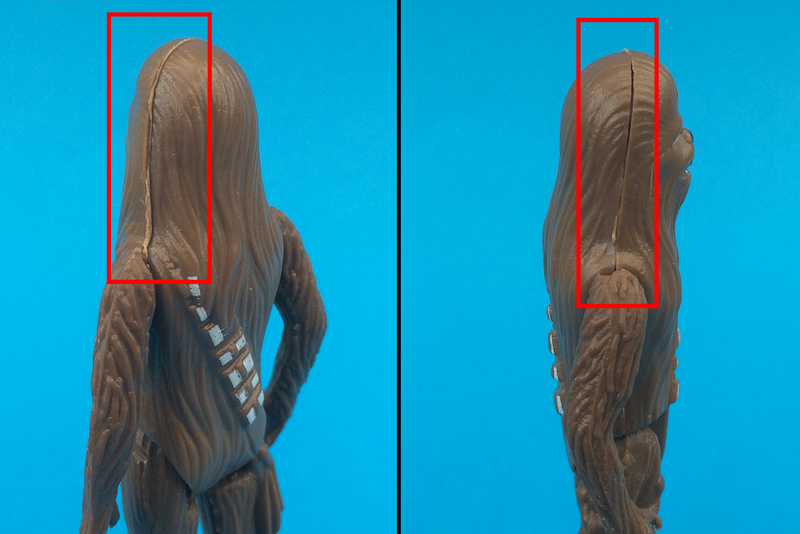 Some people have claimed that store owners or even Top Toys themselves added the staples as extra security to stop the bubbles falling off, again this is unproven. 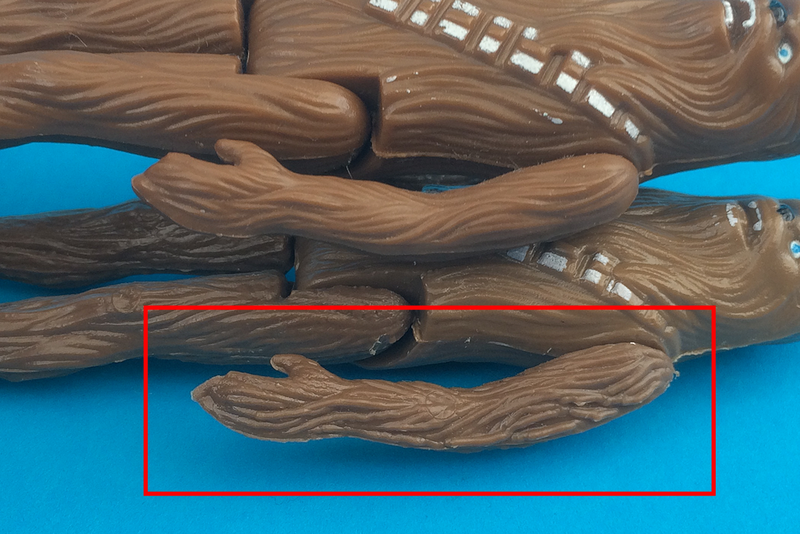 Another reason for the rarity of some of the accessories is the qulaity of the plastics used, Yoda's belt is the best example of this with only a small handful of unbroken belts exist in collectors hands as the shear fragile and brittle nature of this part means that most sealed examples of the Yoda figure contain a broken belt inside the bubble! 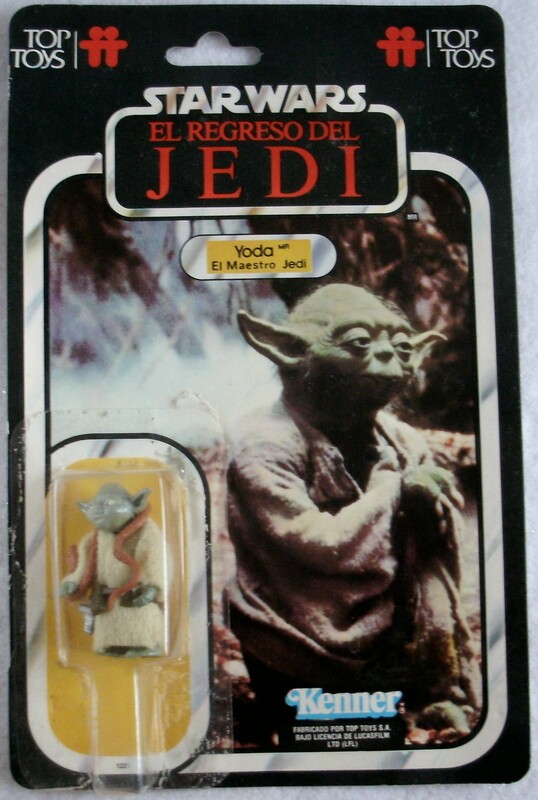 The Top Toys packaging mimicks it's Kenner counterpart from the front, however Top Toys made several small changes for the Argentinian market including Spanish translations for some character names and the changing the "RETURN OF THE JEDI" title to "EL REGRESO DEL JEDI". 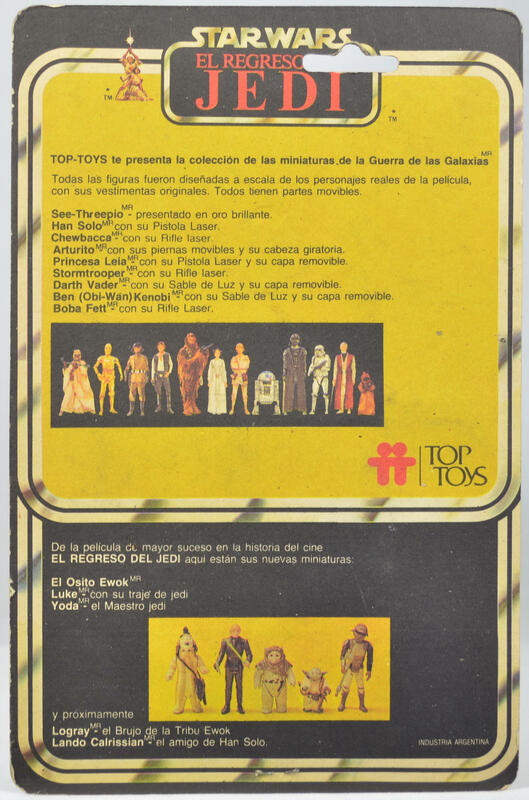 The full range of card backs can be viewed further down this page along with an small guide on how to distinguish the card back variants that exist for the Top Toys figure range. 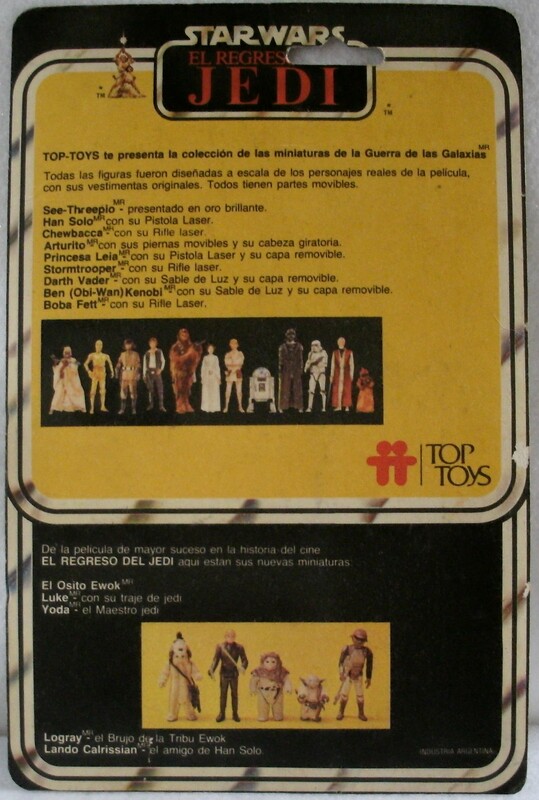 The Spanish translations for the character names. 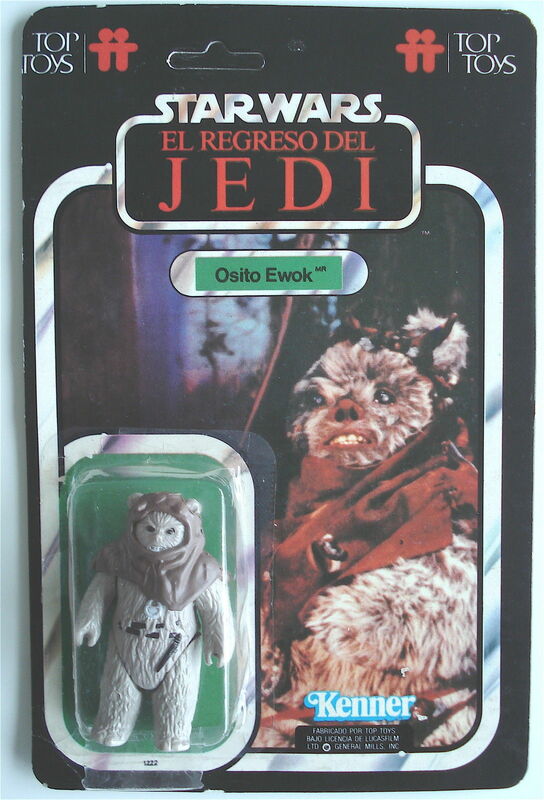 (2) Osito meaning "Toy Bear or Teddy"
And all the TIG team for your comments and support! 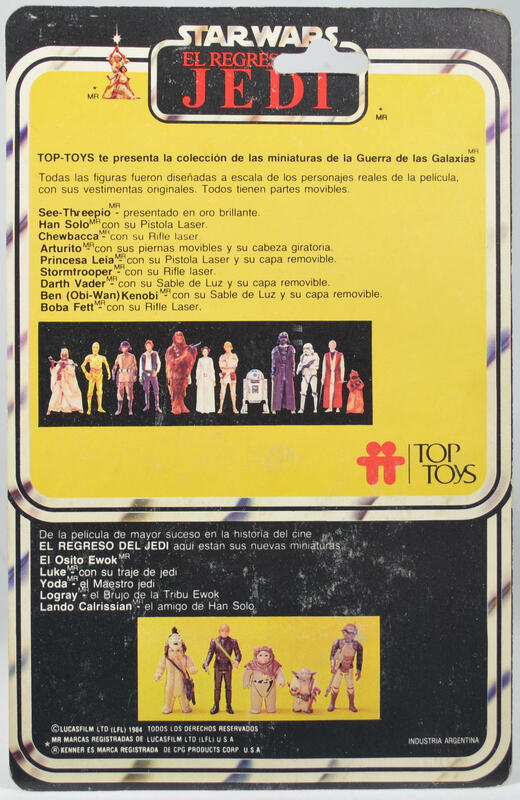 Although the Top Toys range of figures was short-lived, the artwork for the card backs changed several times. 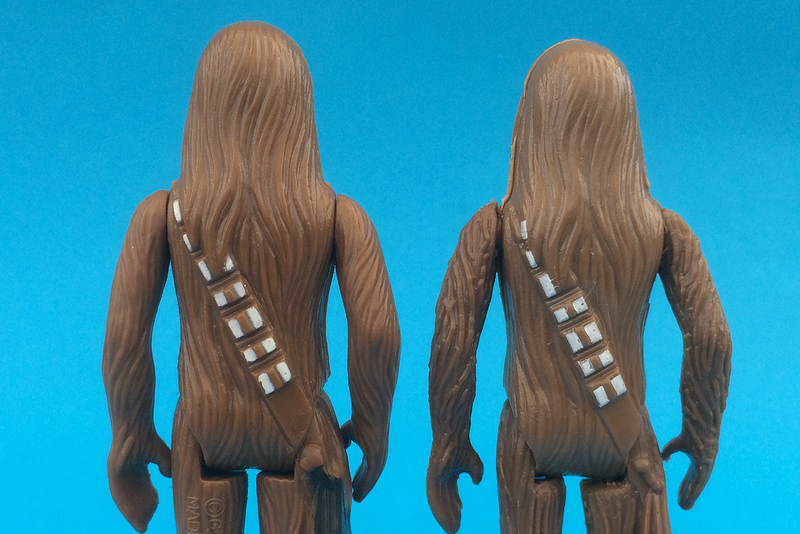 These changes have never been fully documented and are still relatively unknown in the collecting community. 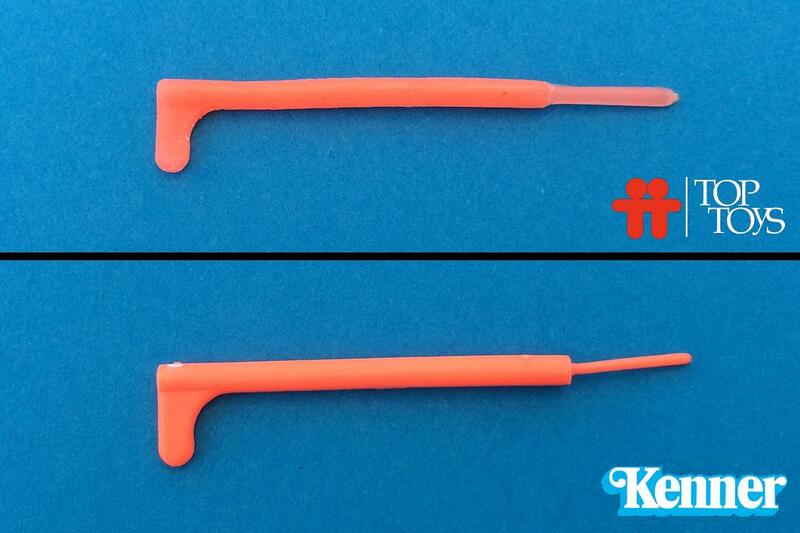 This guide will aim to document these difference for the first time. 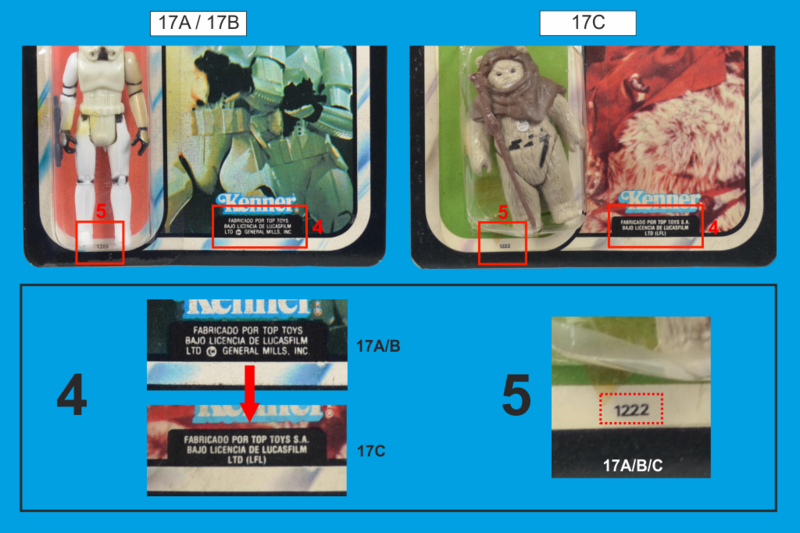 The collecting community has already coined the phrase '17 backs' for the Top Toys cards which is based on the images found on the reverse of the cards. 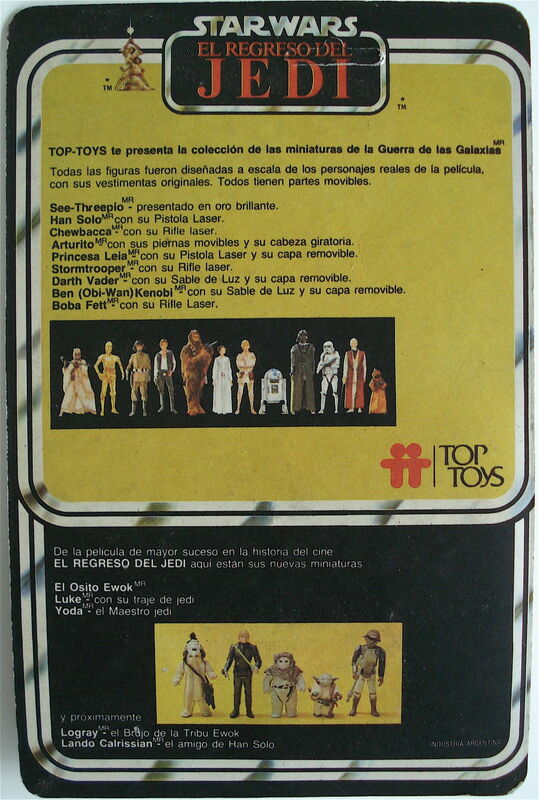 However, if you look closely you will find that only eight of the first twelve figures are actually named. 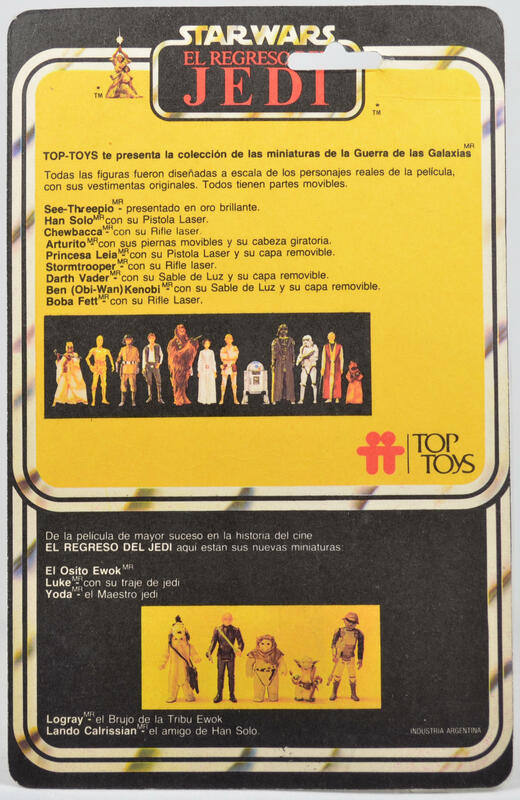 In addition, you can also see that the following text 'Boba Fett - con su Rifle Laser' appears as the last name on the top list. 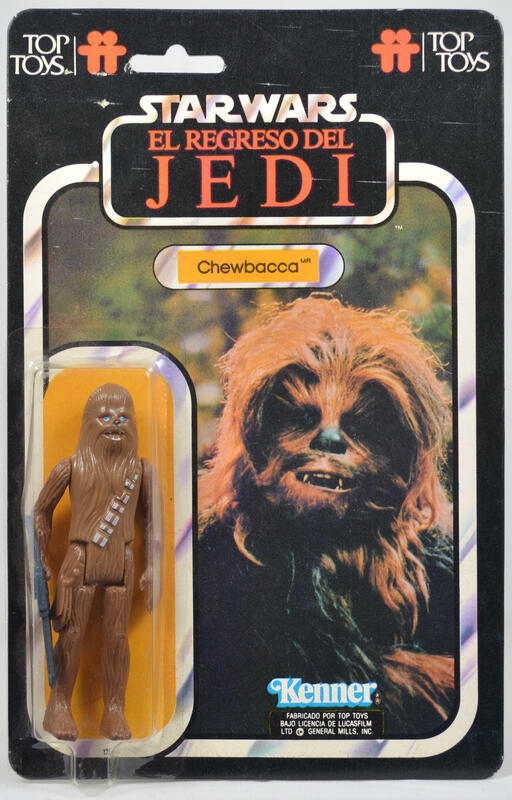 We know from pre-production pieces which have surfaced that this particular figure was pencilled for a release but never got past the prototype stage. 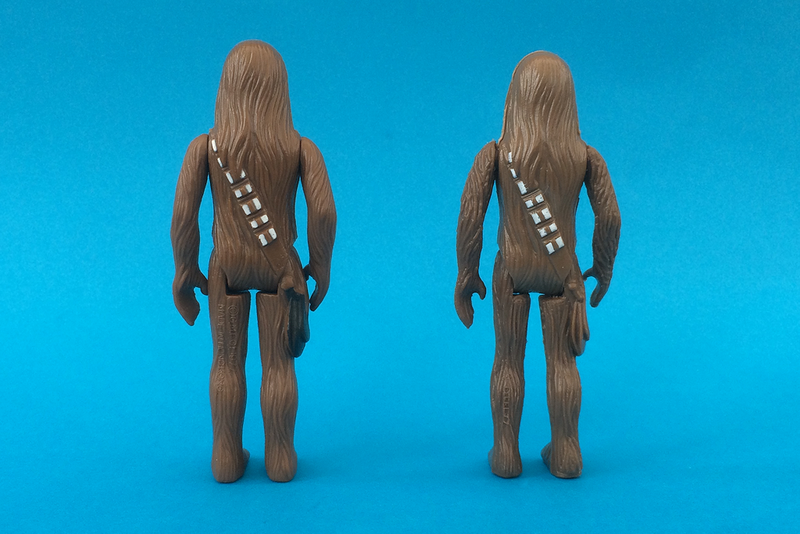 While we could have adopted the name '14 backs' based on the text descriptions, or even '18 backs' if you add Boba Fett into the mix, this guide has decided to keep with the '17 back' terminolgy. 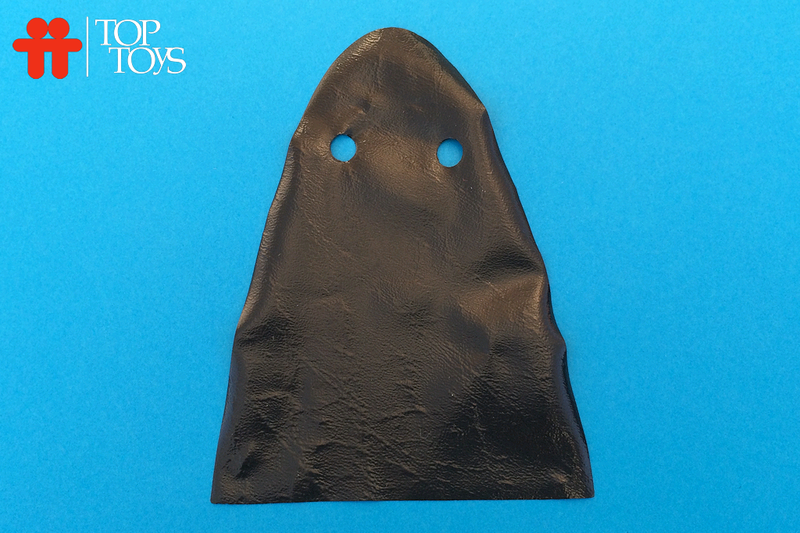 Due to the amount of known card back designs we have included designations such as 17A, 17B and 17C. 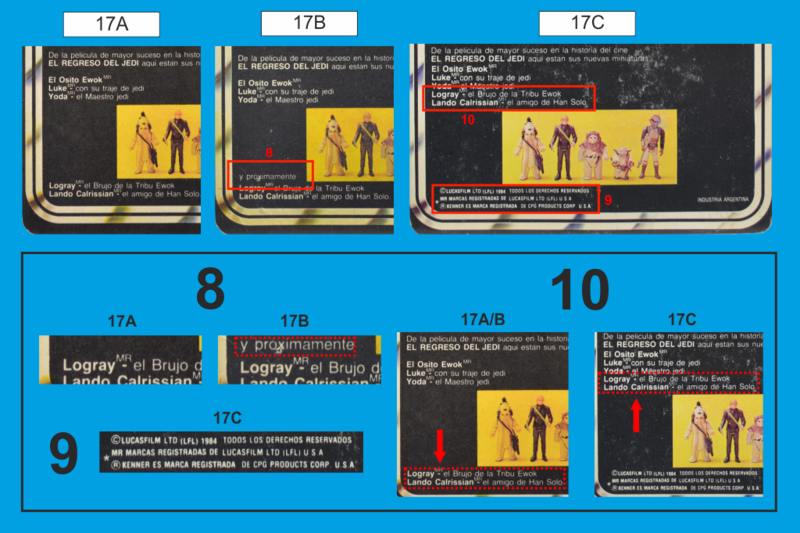 Below you will find a list of all the differences found on the 17A to 17C card backs. 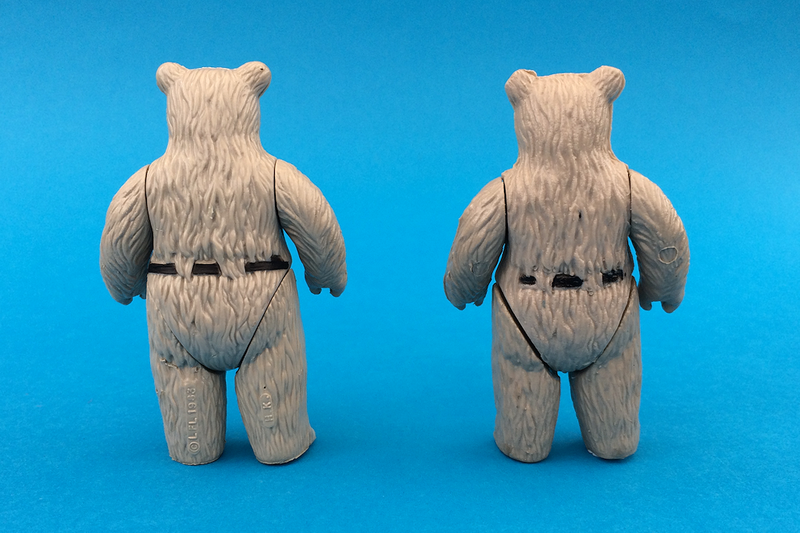 1 - Hanger Slots. 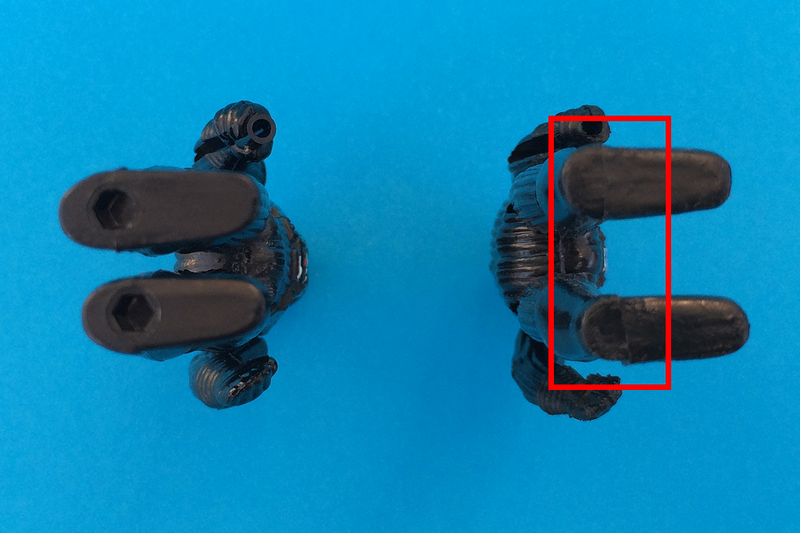 While the placement of the punched slot is completely random on all card backs designations, the ones found on the later issued 17C have a larger notch in the centre. 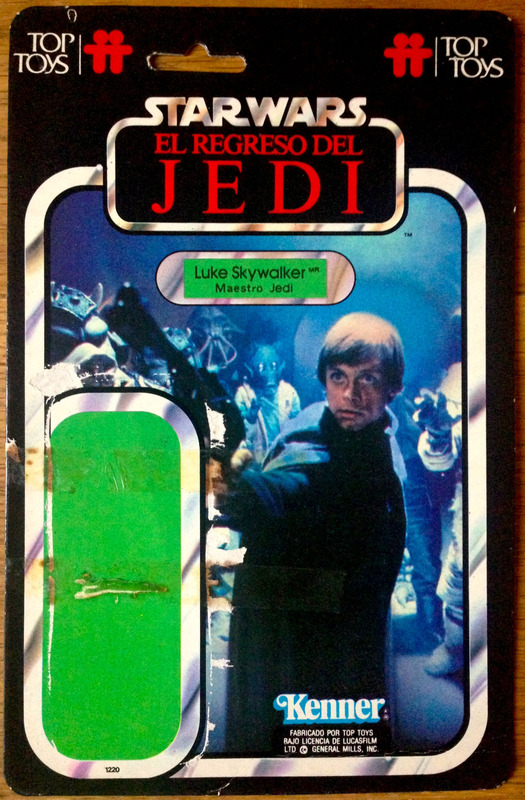 2 - The trademark symbol located to the lower right corner of the EL REGRESO DEL JEDI logo was updated on the 17C card backs from TM (Trademark) to MR which is short for MARCA - in Spanish this can be translated as 'brand' or 'trademark'. 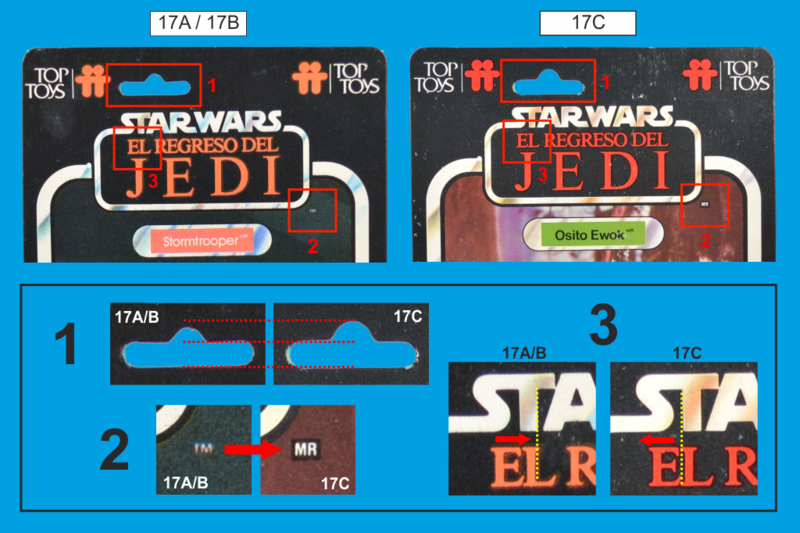 3 - The alignment of the red EL REGRESO DEL JEDI text compared to the STAR WARS logo is different when comparing the 17A/B's to 17C. 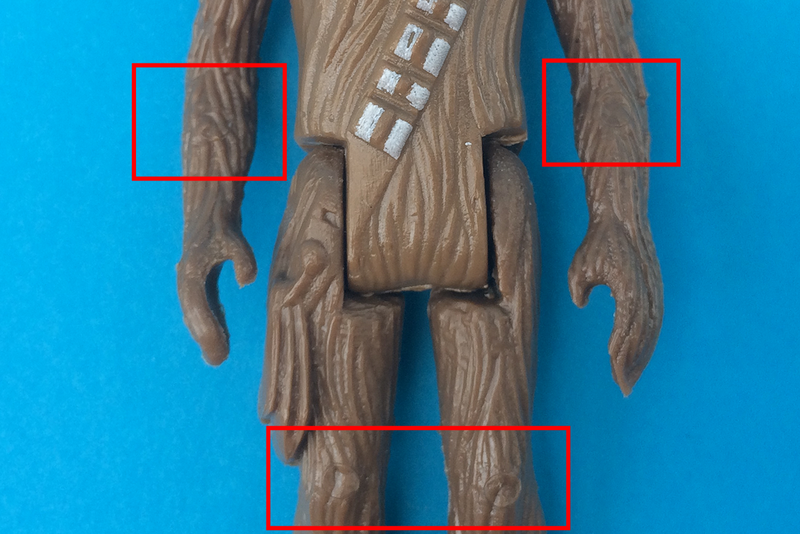 If you look closely you can see that the long vertical edge of the "L" is either aligned with the left or right of the "T" depending on the type of card back. 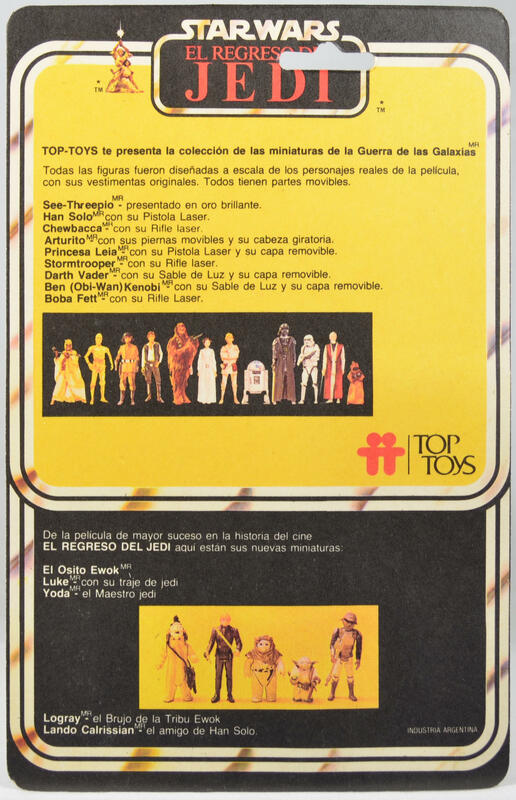 4 - The licensing information underneath the Kenner logo was updated on the 17C card backs from "Licensed by Lucasfilm Ltd (c) General Mills, Inc." to a more simplified "Licensed by Lucasfilm Ltd (LFL)" This was more than likely due to changes at CPG (the parent company) when General Mills the toy division was restructured in 1984-1985. 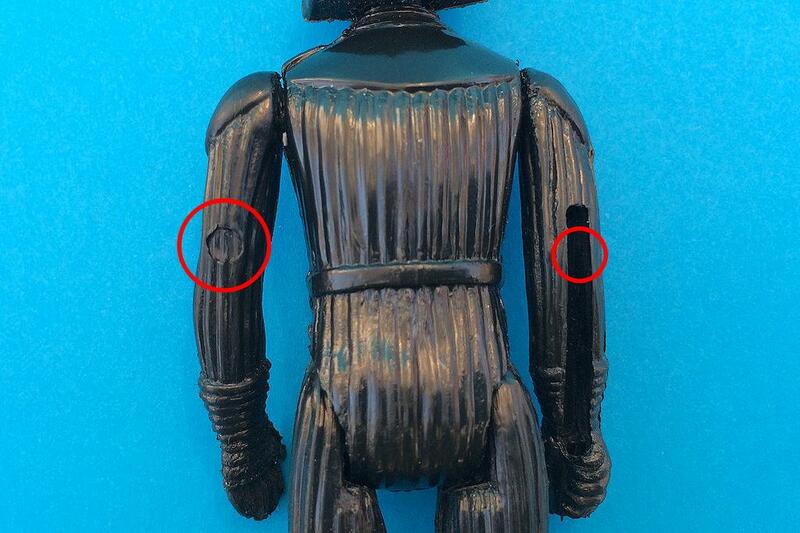 5 - Located below the bubble is a catalogue number. 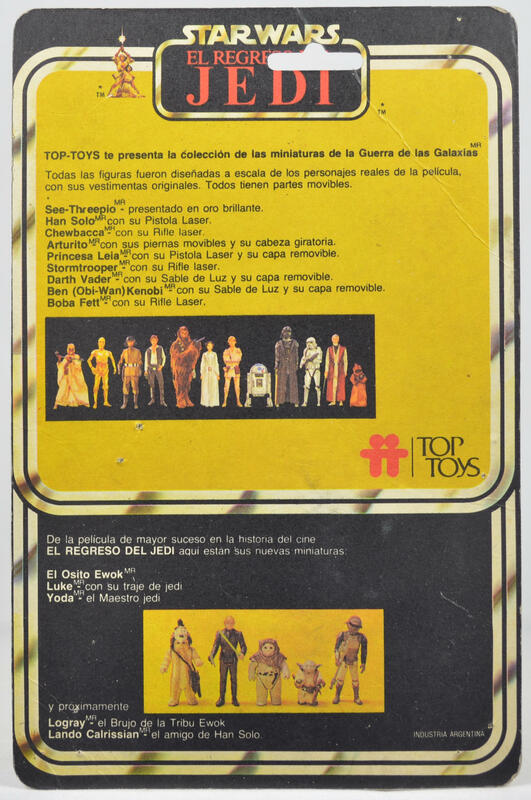 While these are not unique to any card back they are unique to each of the individual characters so are worth a mention. 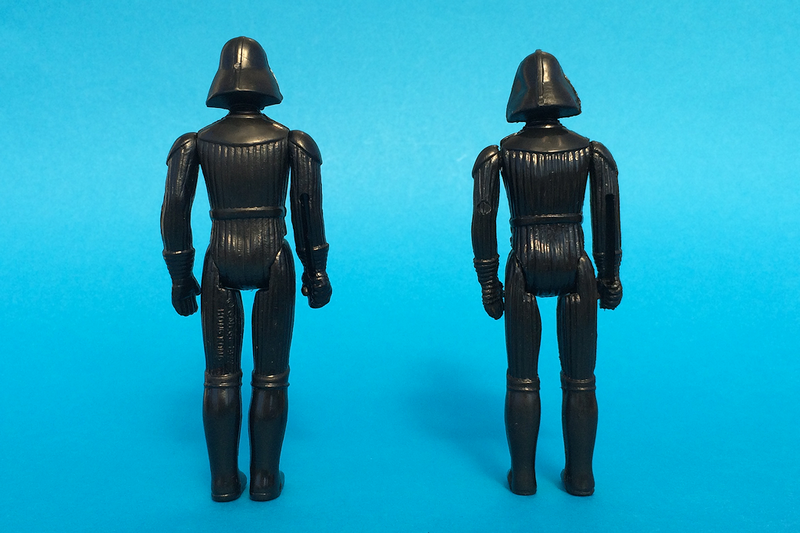 Below is a full list of the numbers used for the Star Wars action figure range. 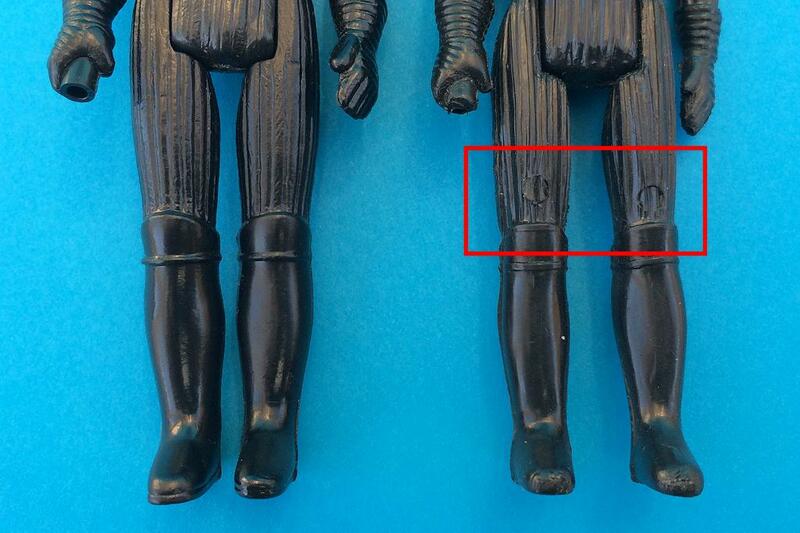 As you can see there are large gaps in the numbering, the reason for this is unknown. 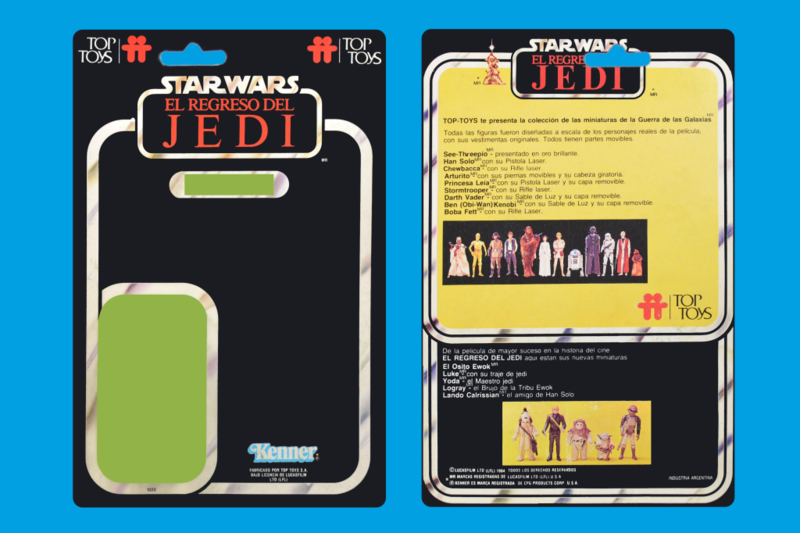 6 - The trademark symbols found next to the Luke and Leia image and to the lower right of the EL REGRESO DEL JEDI logo were also updated on the reverse of the 17C card backs from "TM" (Trademark) to "MR" (Marca) the Spanish for 'brand' or 'trademark'. 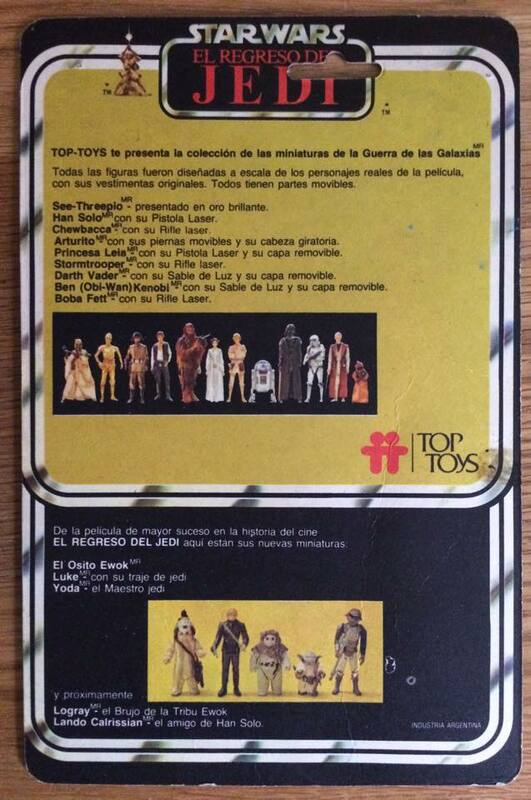 7 - The type of card used on the later 17C release card back was also different. 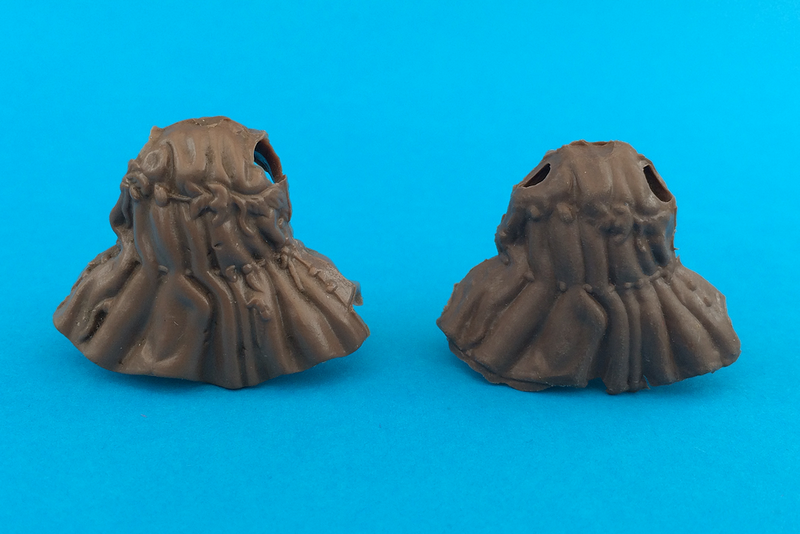 This is more noticeable when viewed from the reverse. 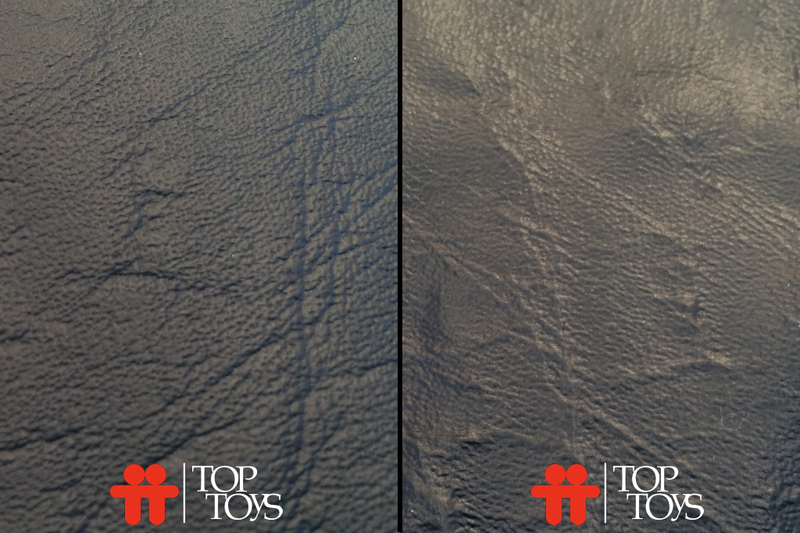 If you compare the images you will see that the 17A and 17B have a matte finish as opposed to the 17C which has a glossy finish. 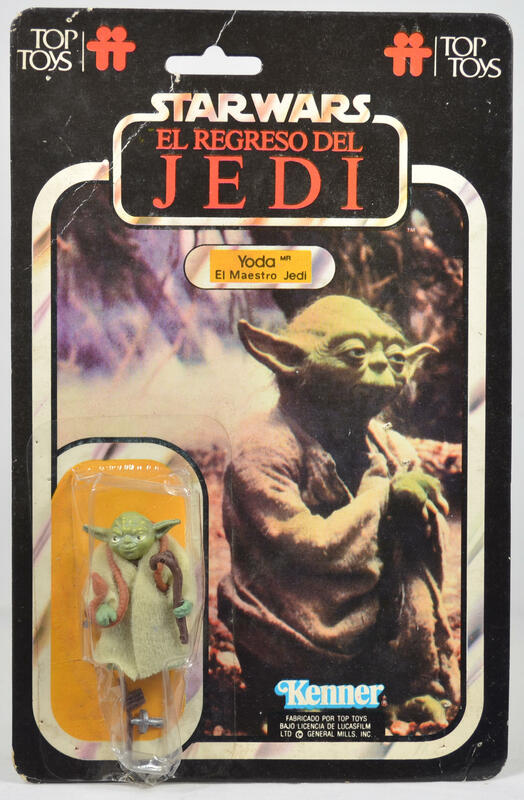 8 - The only difference between the 17A and 17B card back is the wording "y proximamente" which in Spanish can be translated as 'AND SOON'. 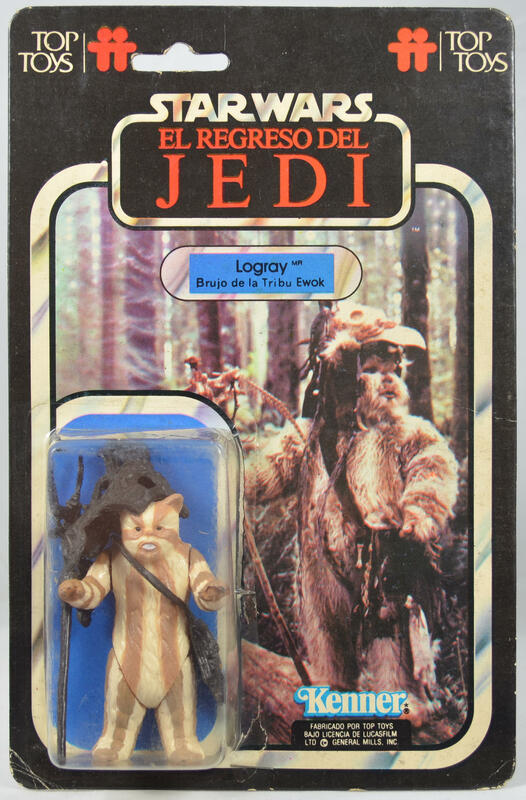 This was referring to the Logray and Lando Calrissian figures, the latter of which was never released. 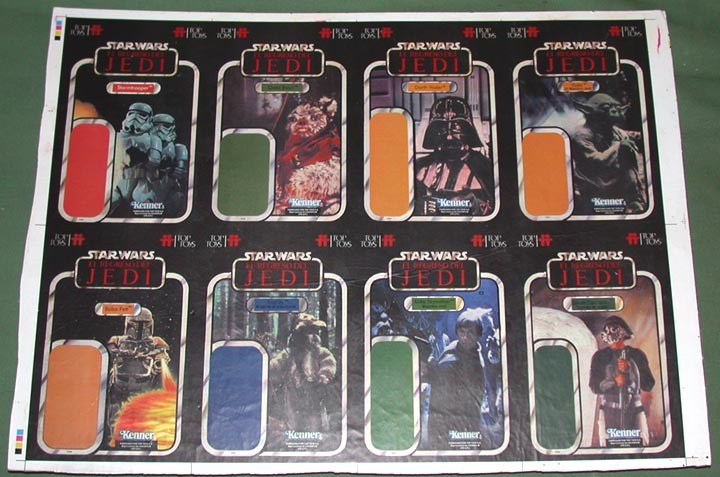 9 - Three extra lines of Lucasfilm & CPG licensing were added to the 17C card backs. 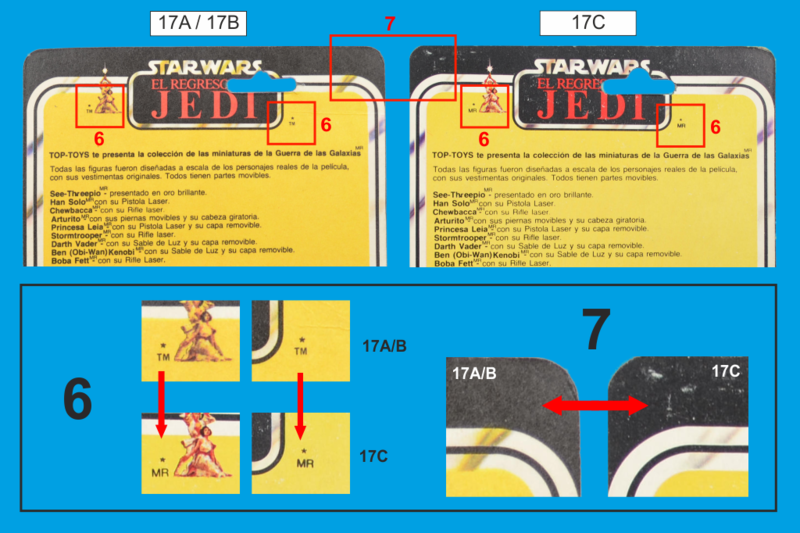 This ties in with the change to the copyright information on the fronts of the cards described in point 4. 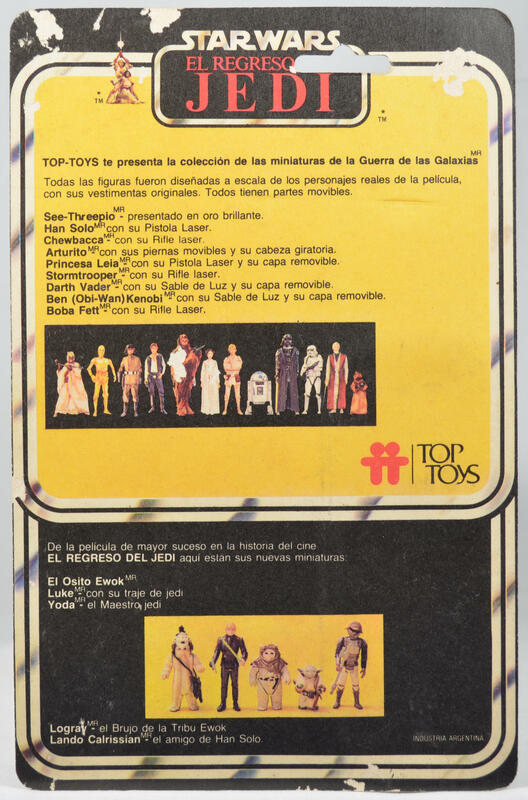 10 - To make room for the additional licensing information on the bottom left corner on the reverse of the card backs, the Logray and Lando Calrissian names and character descriptions were re-positioned above the image of the five ROTJ/ESB characters. 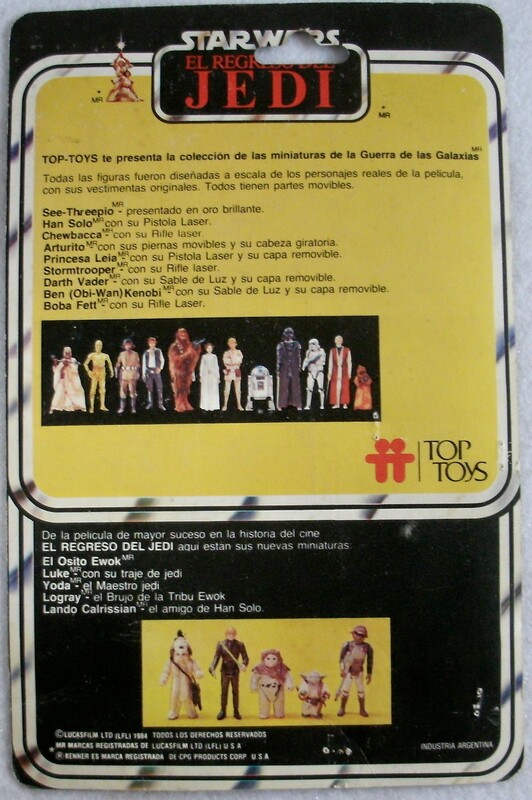 The above ten points highlight the known differences which can be found on the three Top Toys card back variants. 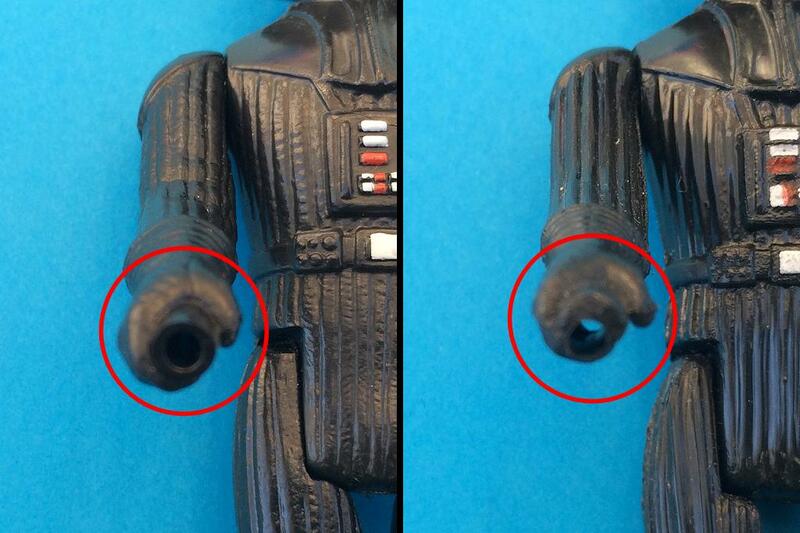 If you know of any other differences or see something we have missed, please feel free to let myself or one of the Imperial Gunnery team know. 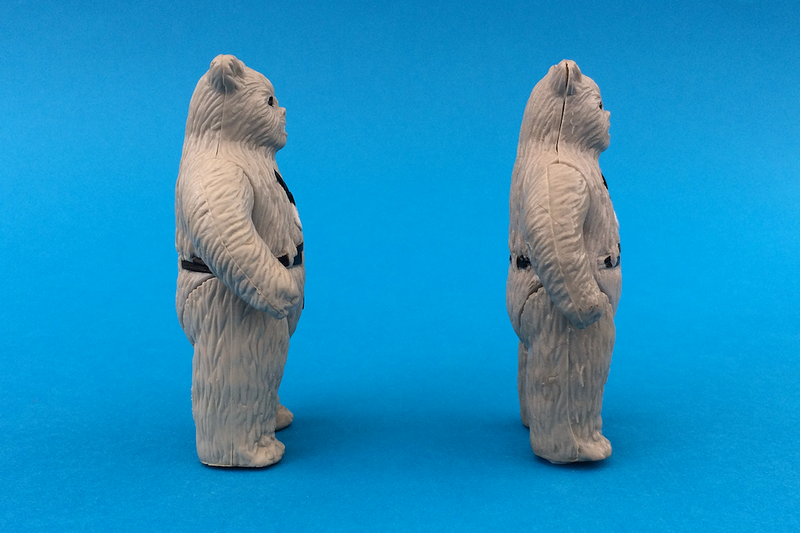 * A known variant but high-res images are not available at this moment in time. 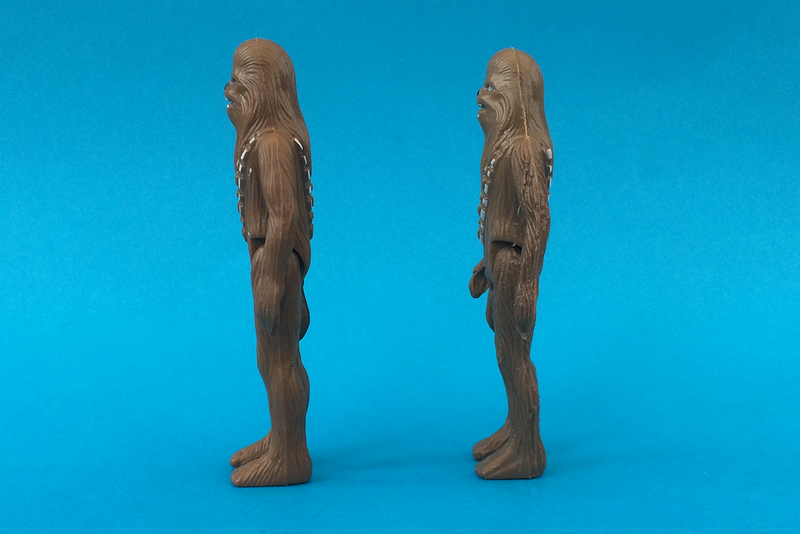 The Top Toys Chewbacca belongs to COO family #VII This family contains only one main variant. 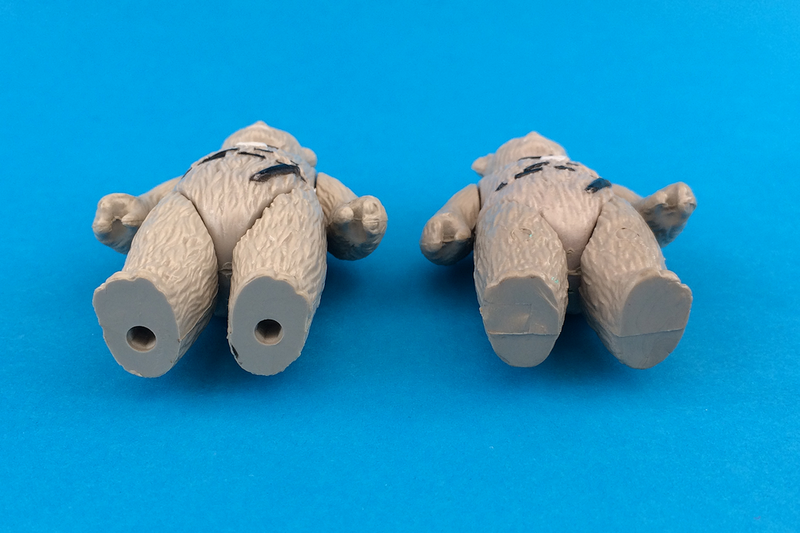 Due to the poor, almost bootleg quality of the Top Toys figure it is impossible to identify which COO family was on the original Kenner figure used for the tooling. 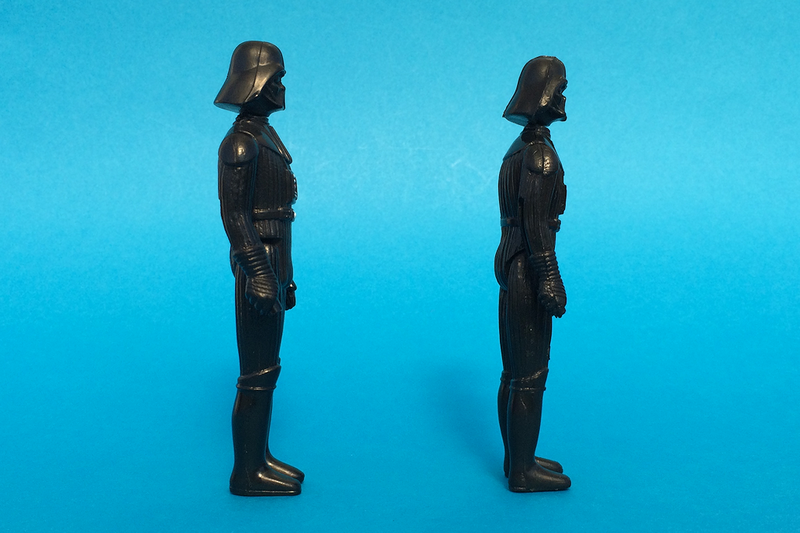 The figure shown on the far right is unique to Top Toys. 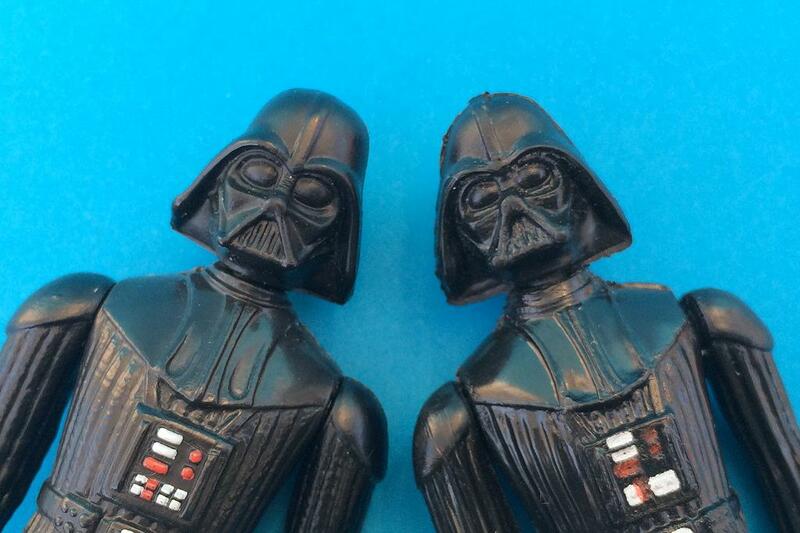 Therefore, no relative exists. 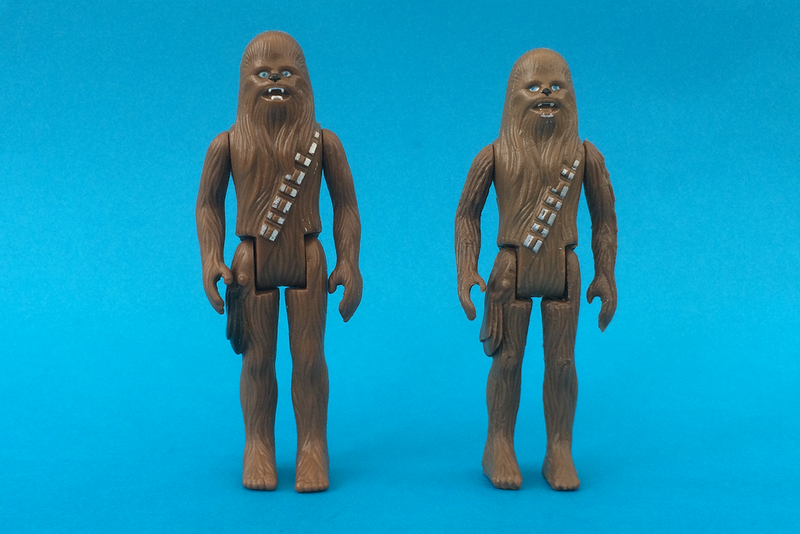 A "Made In Hong Kong" COO Kenner figure has been used for the comparison below. 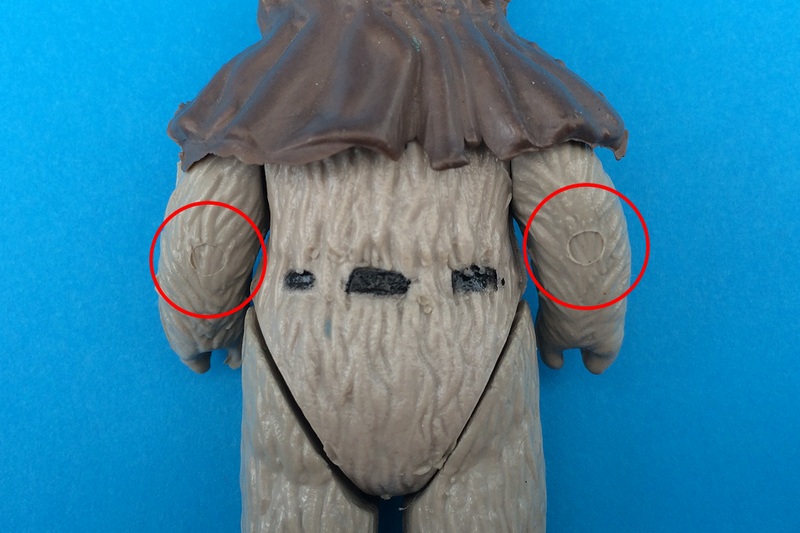 *Chewbacca is the ONLY Top Toys figure to have a COO marking! 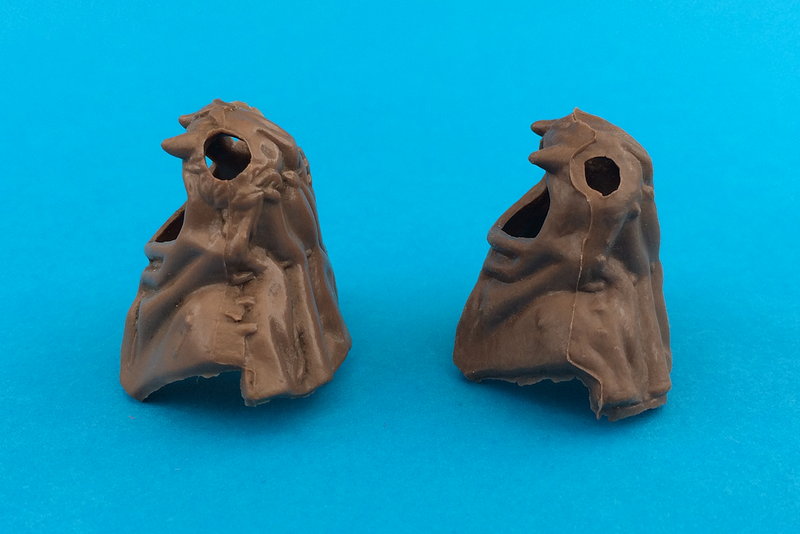 Poor QC often resulted in minor differences between batches. 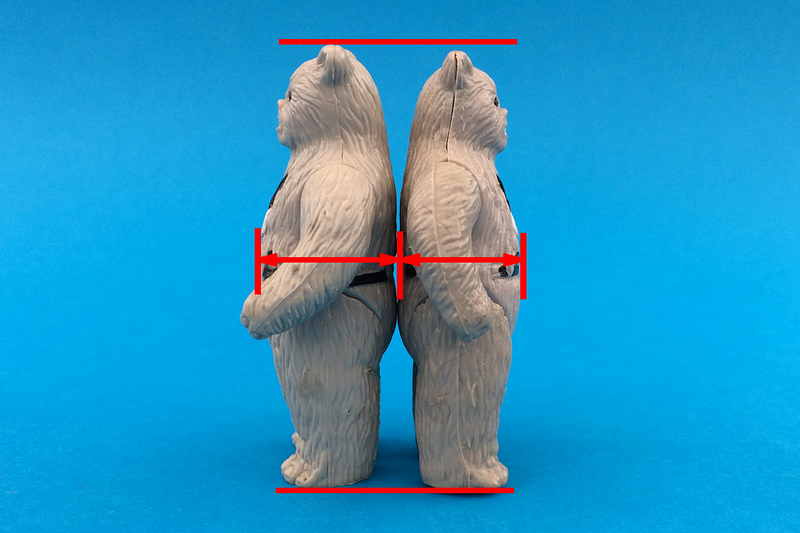 - Poor mouldings, the example above shows a large gap between the torso halves. 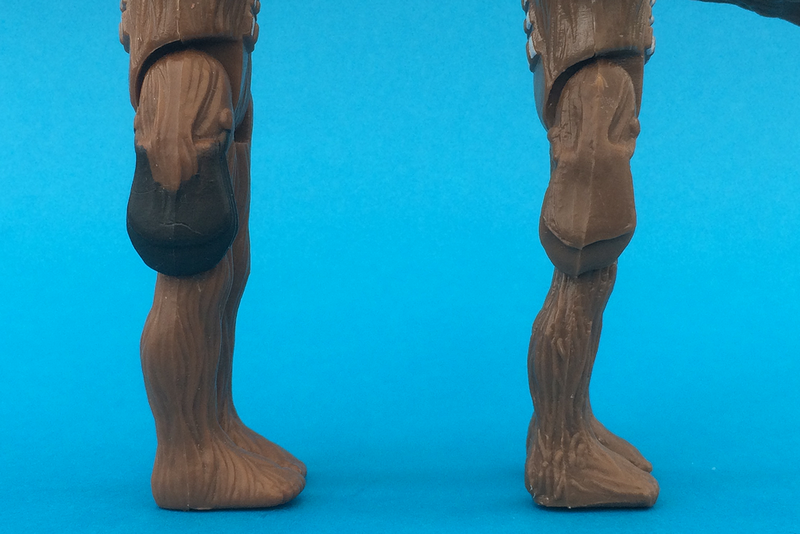 The second and third photos demonstrate the amount of work done retooling or "enhancing" the fur sculpt on the limbs. 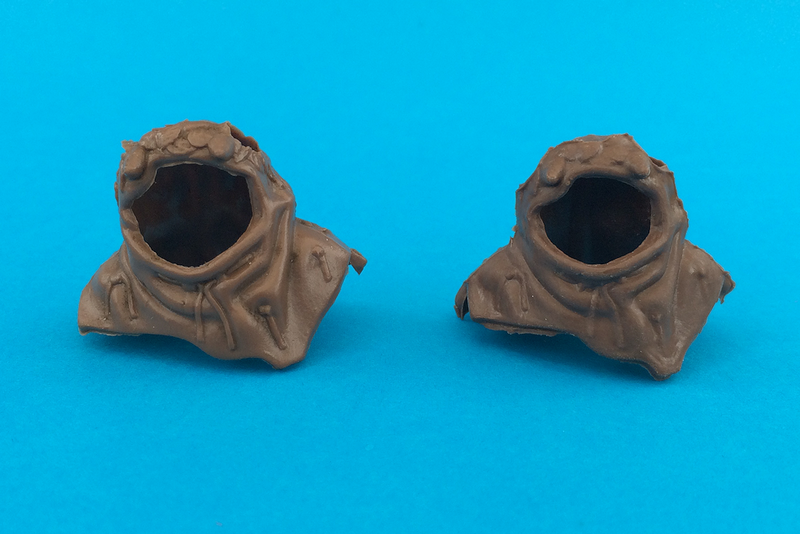 You will notice that the torso sculpt didn't require any reworking as the parts are almost identical. 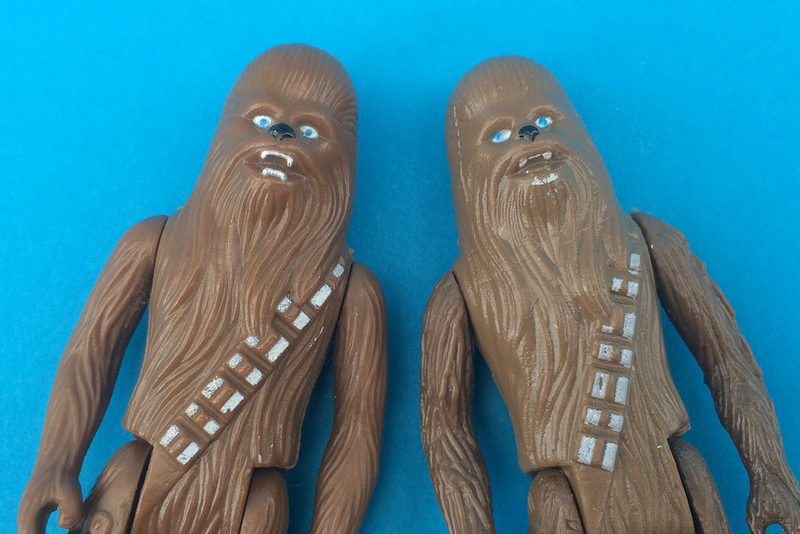 Although easy to tell apart both South American licensees (Glasslite/Brazil & Top Toys/Argentina) somehow managed to produce Chewbacca figures with similar traits. 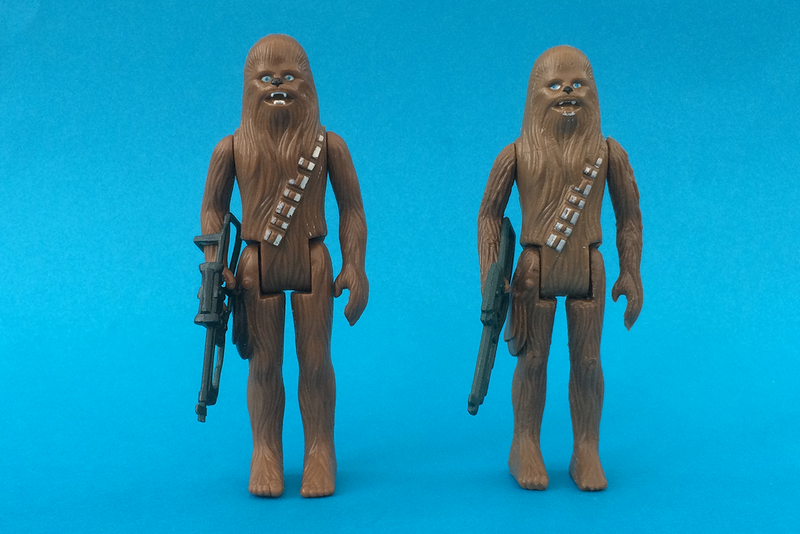 The Top Toys Chewbacca came with a blue/green v4 bowcaster and is compared to standard Kenner accessory below. 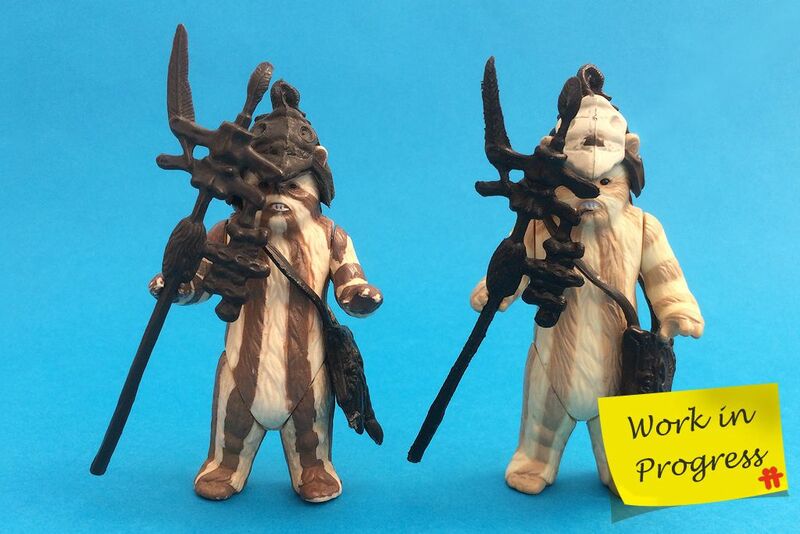 The Top Toys Chief Chirpa belongs to COO family #VII This family contains only one main variant. 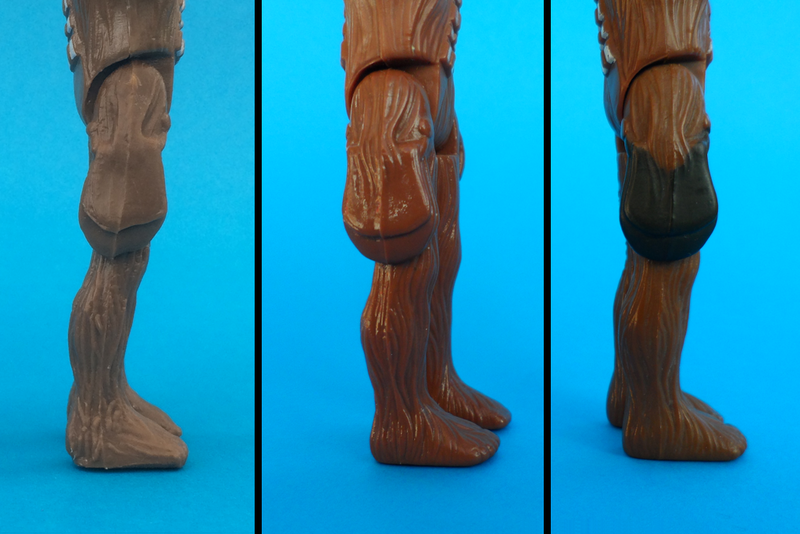 Due to the poor, almost bootleg quality of the Top Toys figure it is impossible to identify which COO family was on the original Kenner figure used for the tooling. 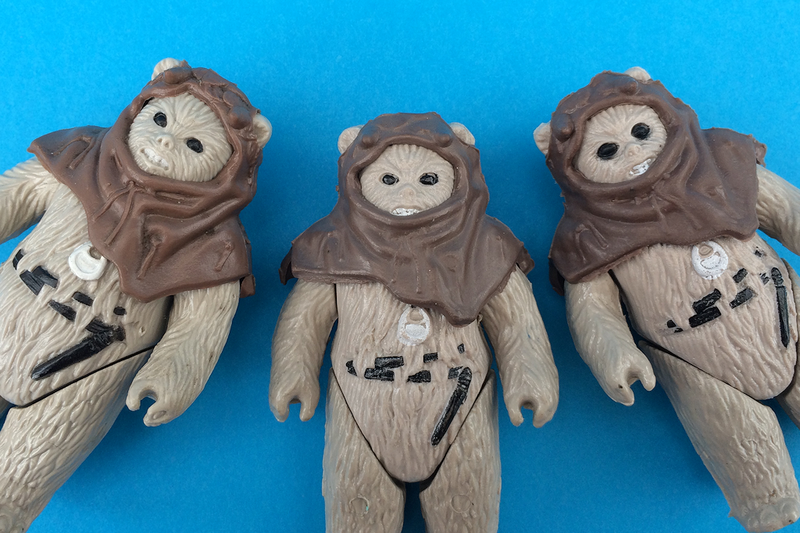 The NO-COO shown on the far right is unique to Top Toys and therefore no relative exists. 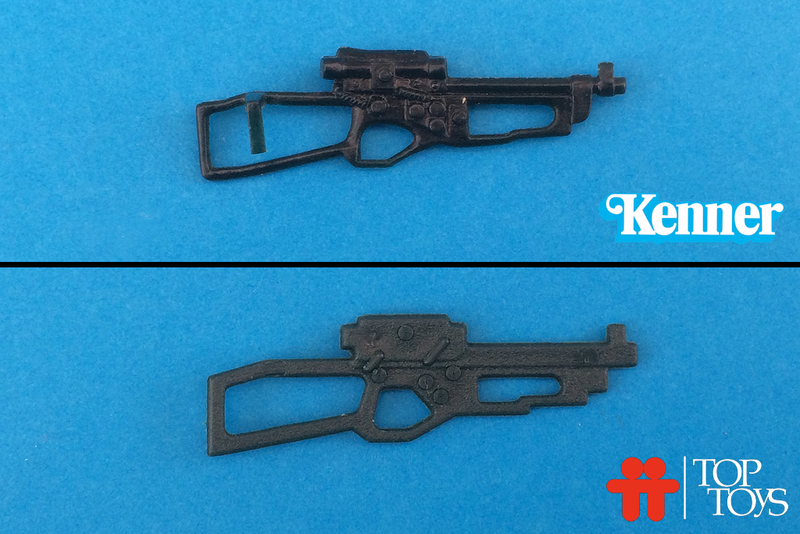 A Hong Kong "H.K." 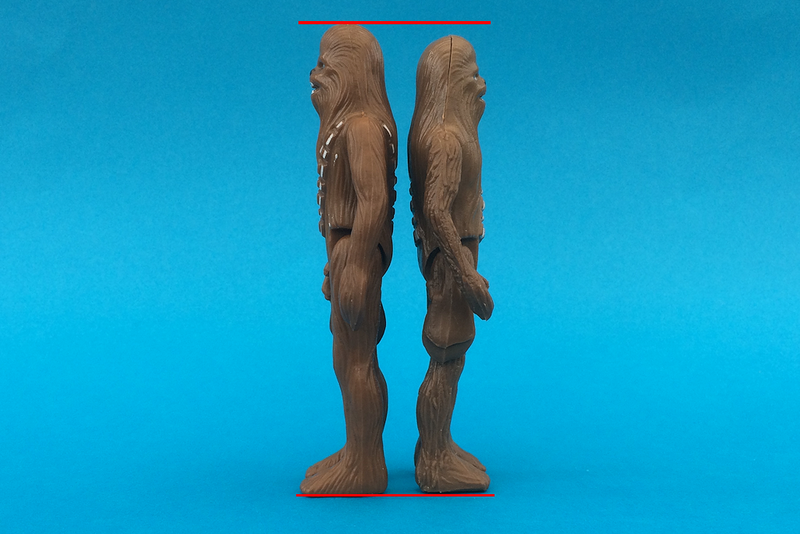 COO Kenner figure has been used for the comparison below. 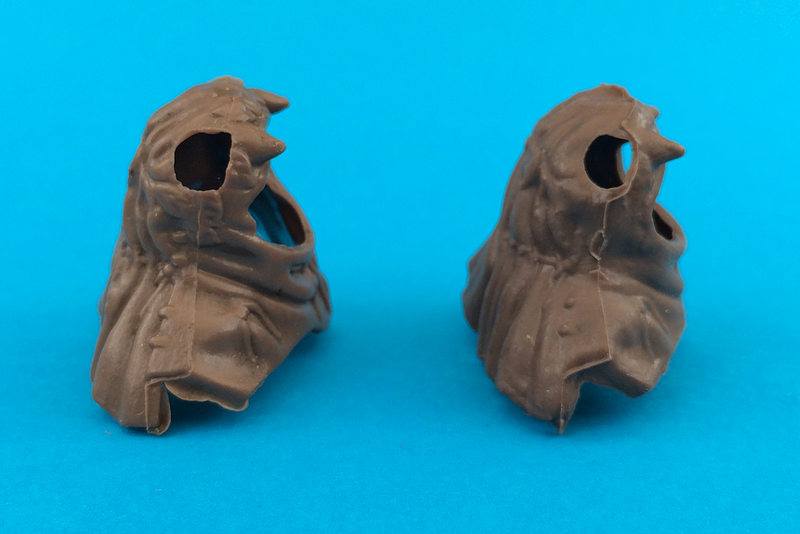 Poor QC also resulted in minor differences between batches. 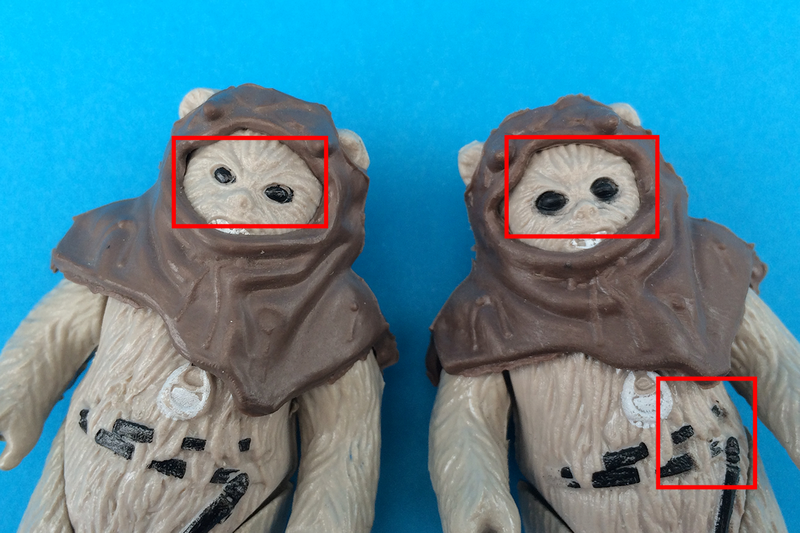 - Poor spray mask applications, note the so called "Bambi" eyes variant shown above. 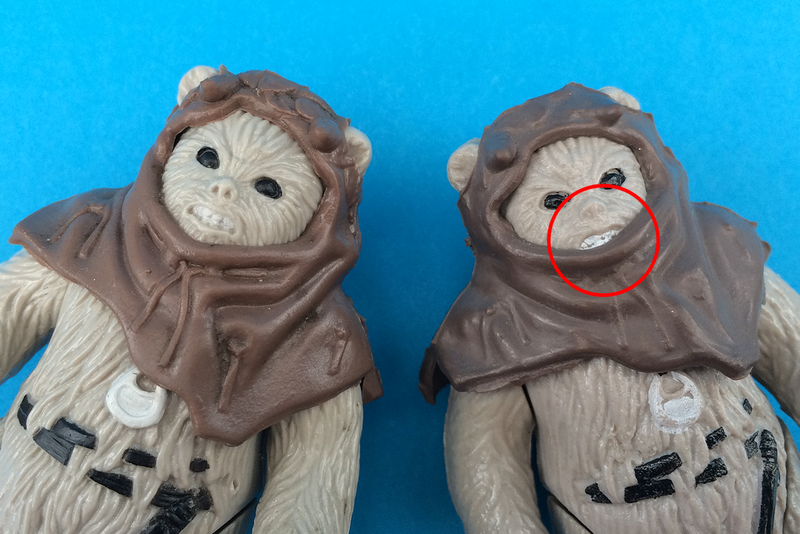 On this same figure we can see over-spray around the eyes and belt as the spray mask wasn't pressing down correctly during this process. 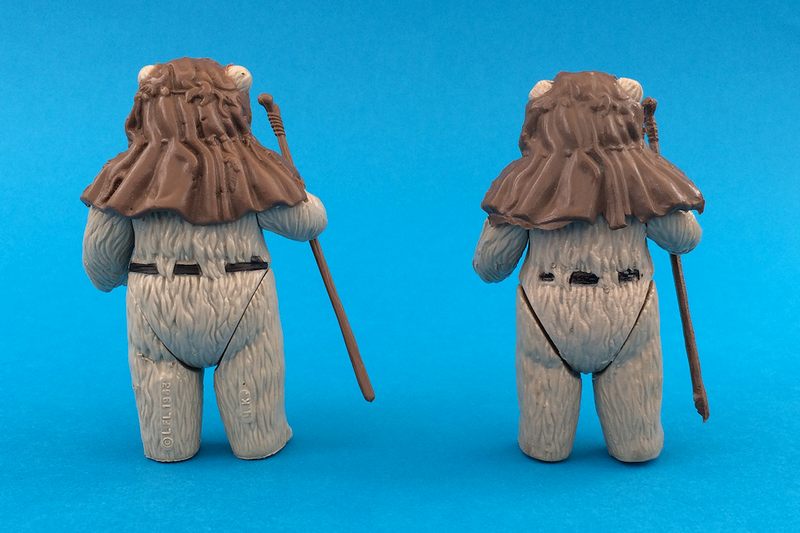 The Top Toys Chief Chirpa came with a dark brown v5 staff and is compared to the Kenner accessory. 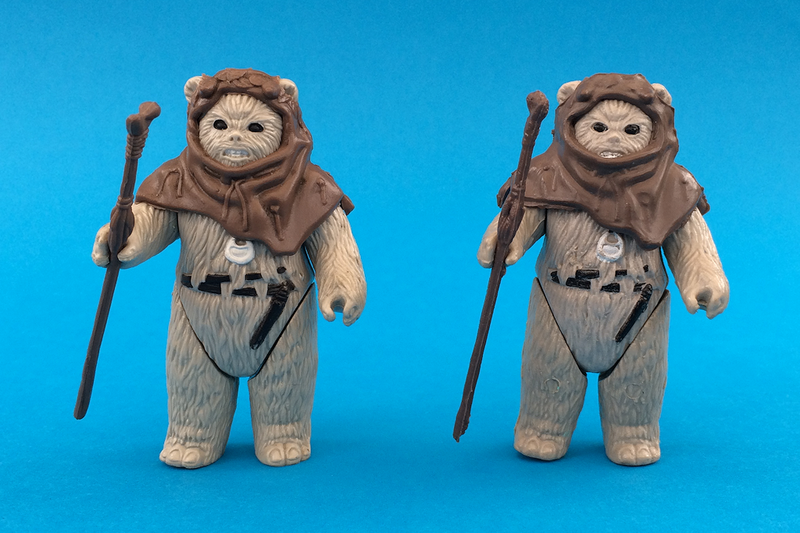 The Top Toys Chief Chirpa came with a dark brown hood and is compared to the Kenner accessory. 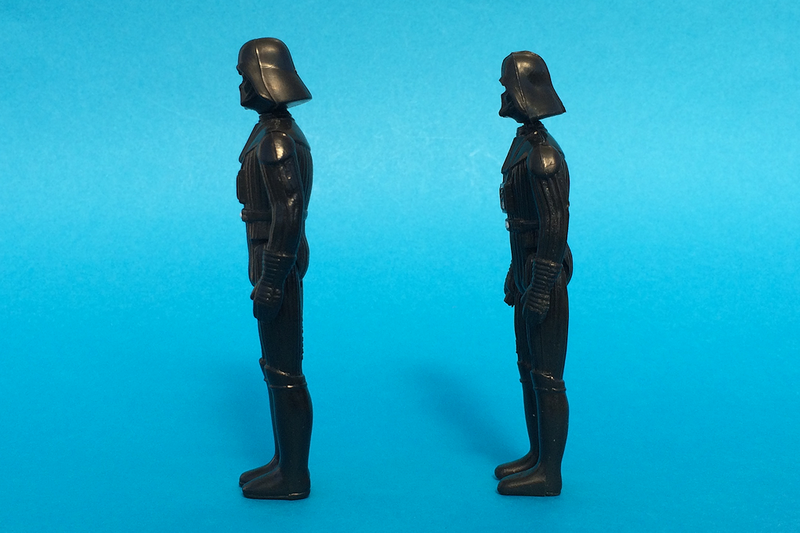 The Top Toys Darth Vader belongs to COO family #X This family contains only one main variant. 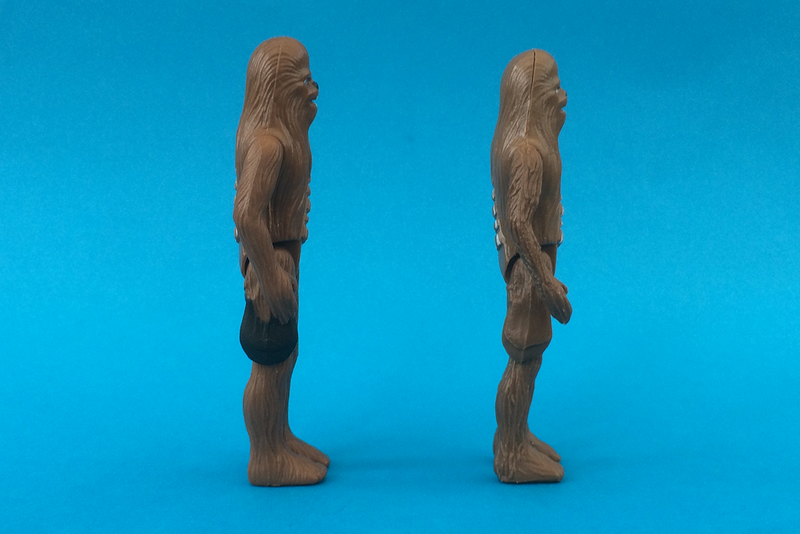 Due to the poor, almost bootleg quality of the Top Toys figure it is impossible to identify which COO family was on the original Kenner figure used for the tooling The NO-COO shown on the far right is unique to Top Toys and therefore no relative exists. 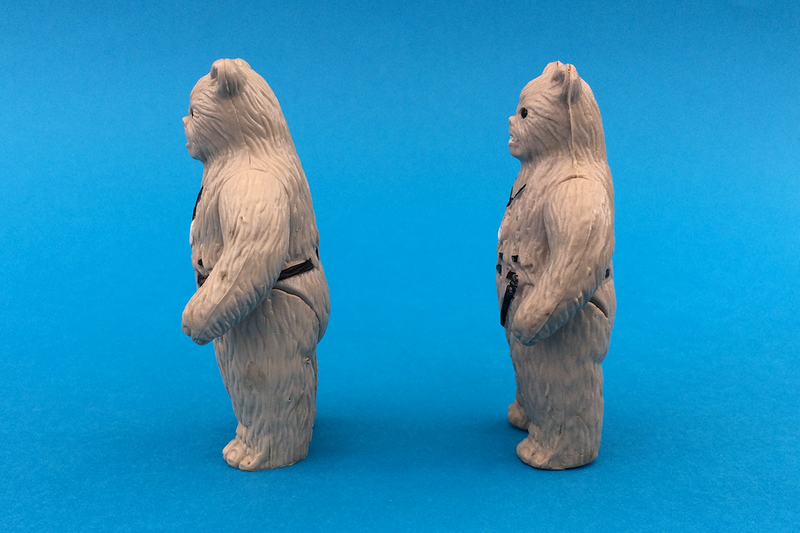 A "HONG KONG" COO Kenner figure has been used for the comparison below. 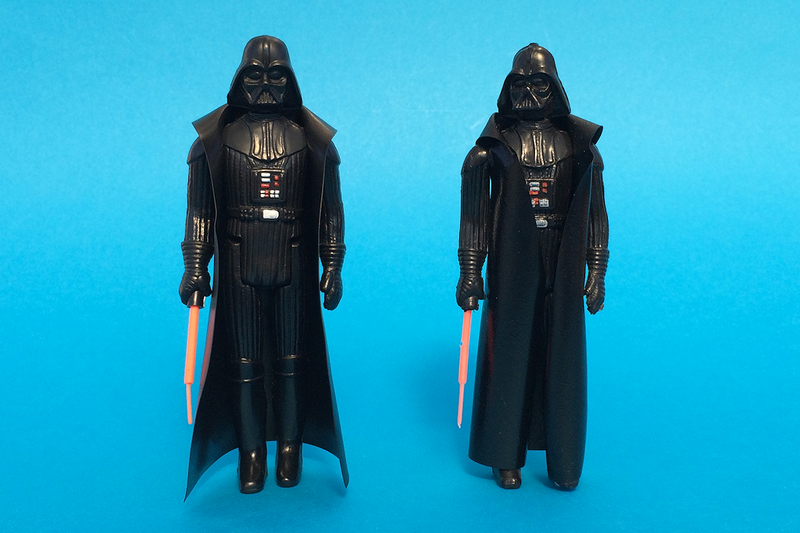 The Top Toys Darth Vader came with a semi-transparent v6 Lightsaber and is compared to the Kenner Lightsaber. 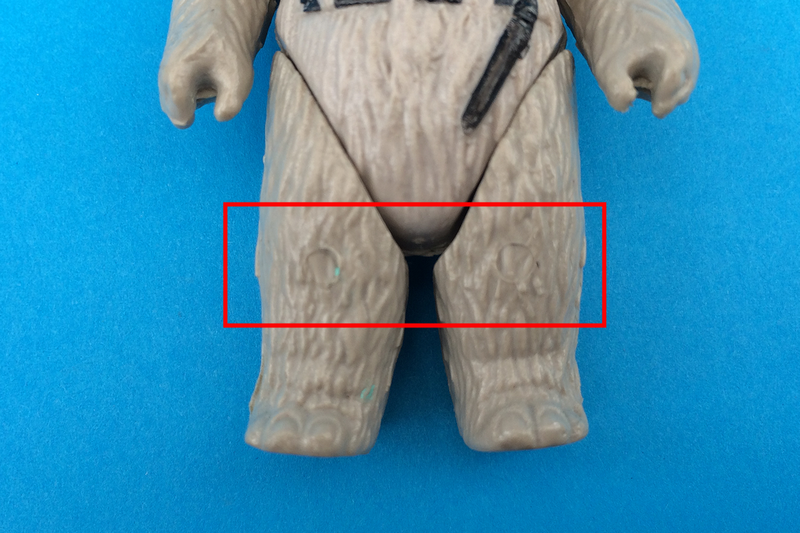 (*) Until now the EPM mark has never been properly documented on the Top Toys lightsaber variant. 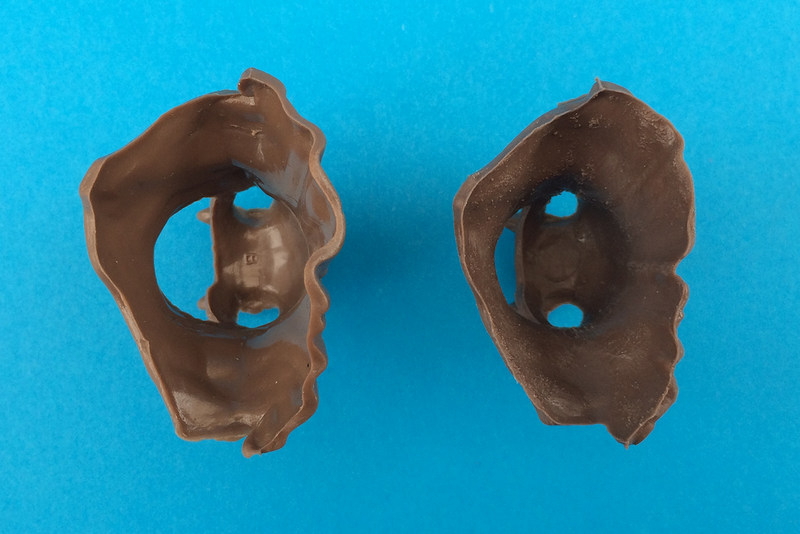 So, on behalf of the TIG team, I can now reveal with photographic evidence that this can be found on either side of the main body, thus concluding that the mould tool contained multiple cavities - some of which were mirror images. 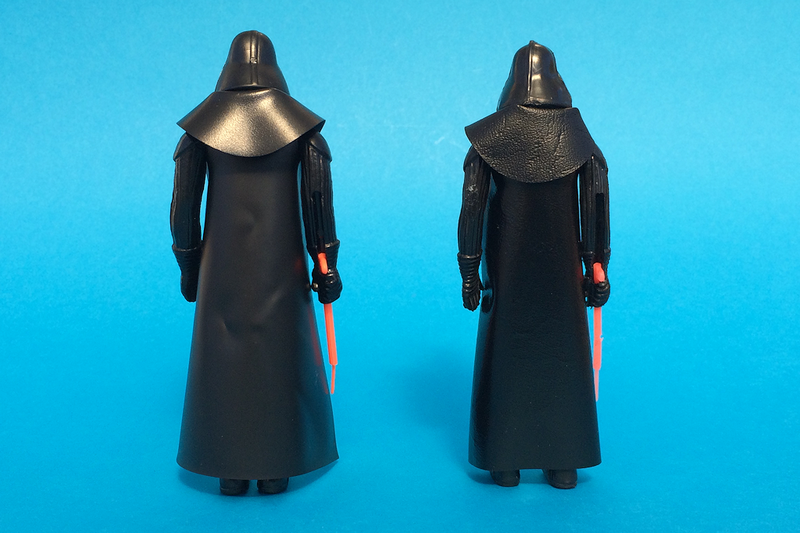 The Top Toys Darth Vader came with a completely unique cape compared to any other Darth Vader figure. 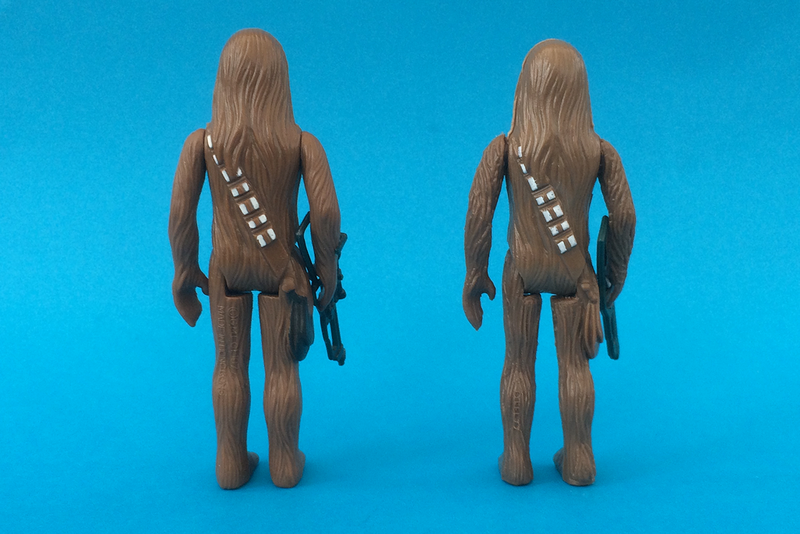 Therefore, I have only shown the Top Toys version below. Lot of hard work. 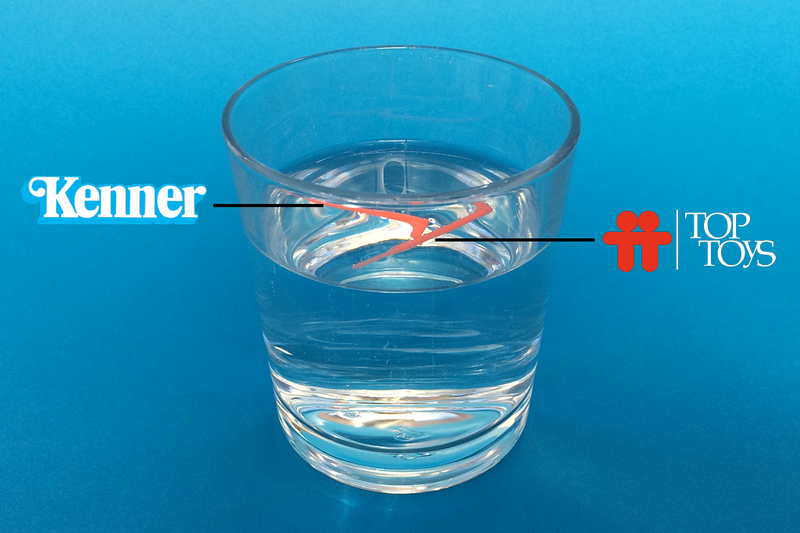 And another great guide is born. Good job Stef. Now to finish it. 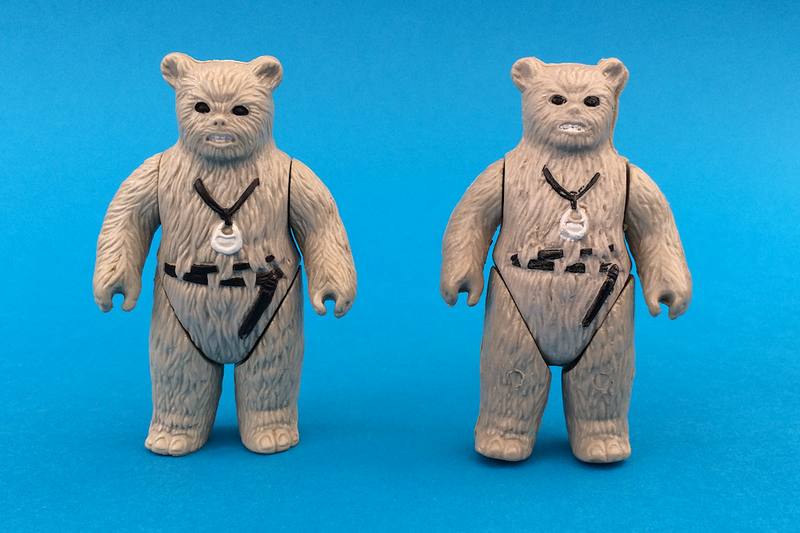 Bump and Chewbacca entry added. 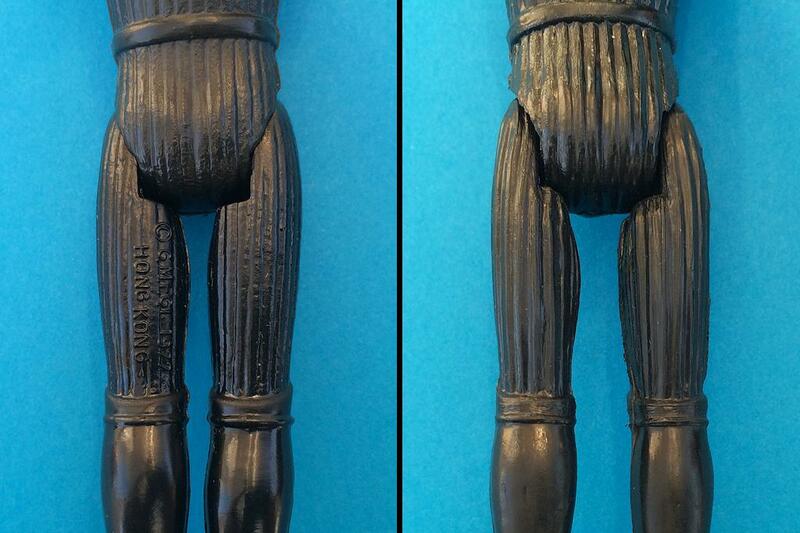 This is really great and informative. 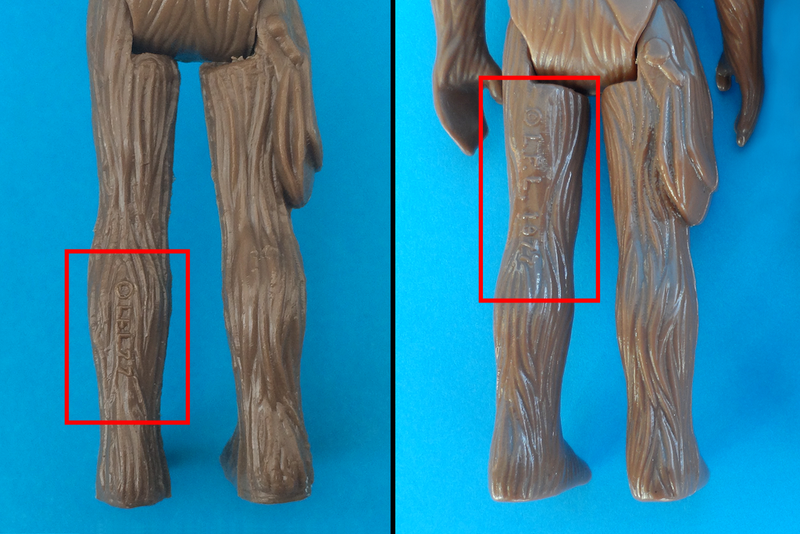 I really do appreciate the work that went into it. 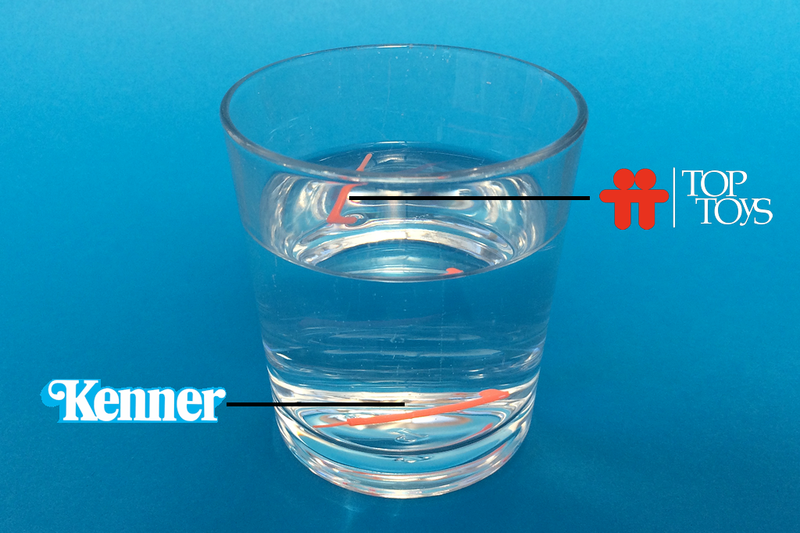 That said it really makes me cringe to see images and references to the so called "water test". 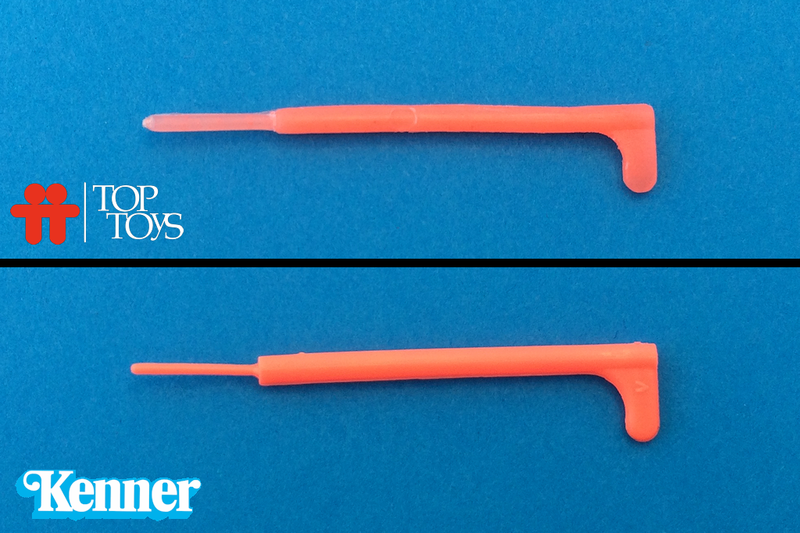 This is a horrible, and needless practice that misleads many people and should never be recommended especially in a guide such as this. 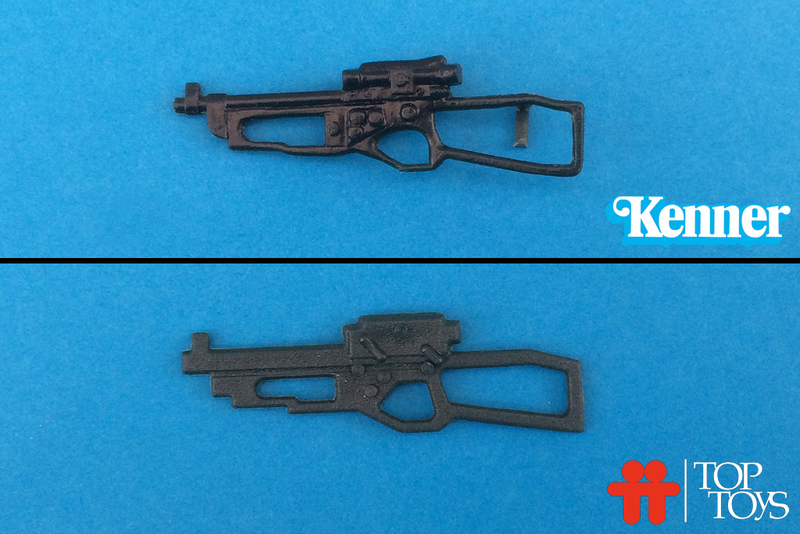 A simple reference to this site and the proper guides on telling accessories apart is all that is required for anyone. 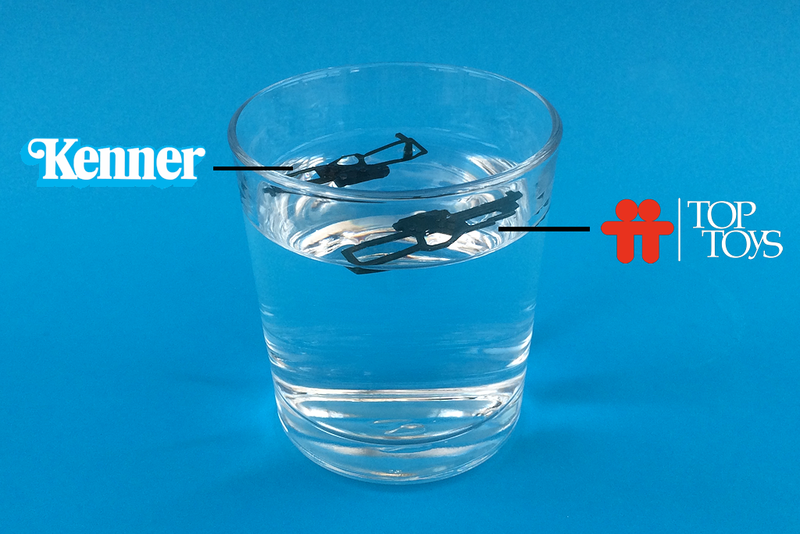 Fantastic stuff Stefan - would love to have you on the show to talk about this guide. 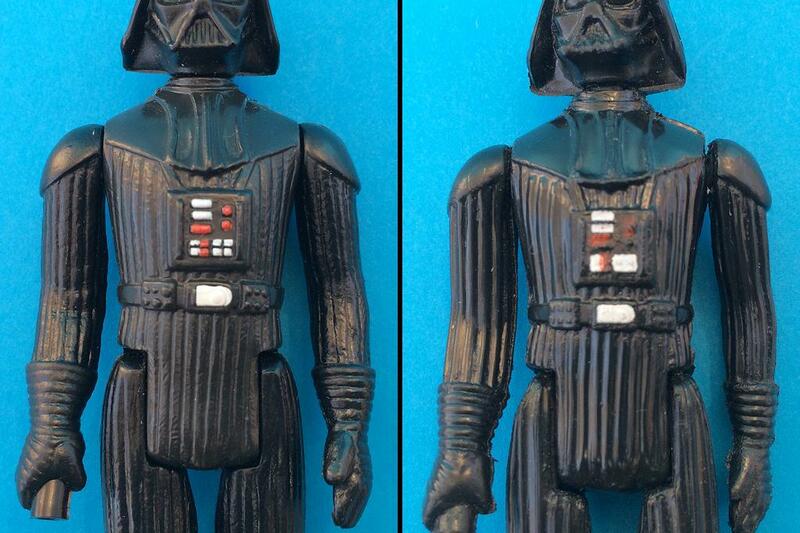 This is every bit as good as the Kenner and Palitoy ones out there. 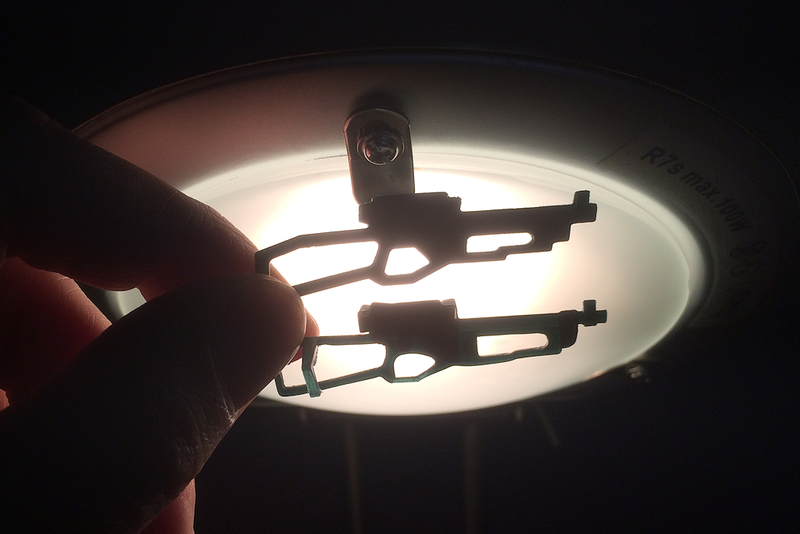 No single test should be used to ID an accessory. 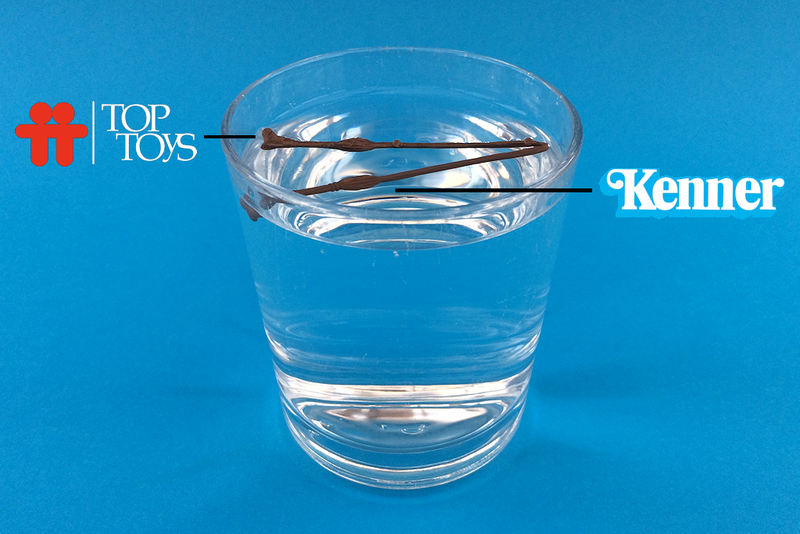 Whilst the float test is useless for some of the recent repro's people still use it. 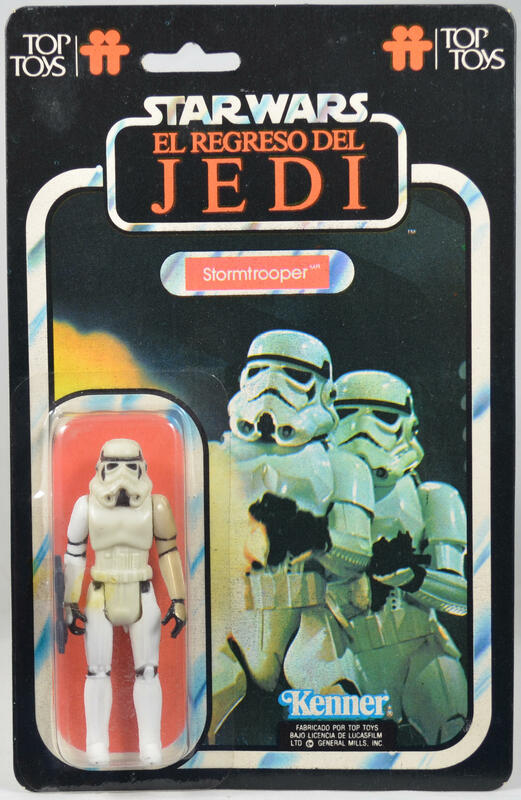 Thankfully there are very few repro's based on the Top Toys line. 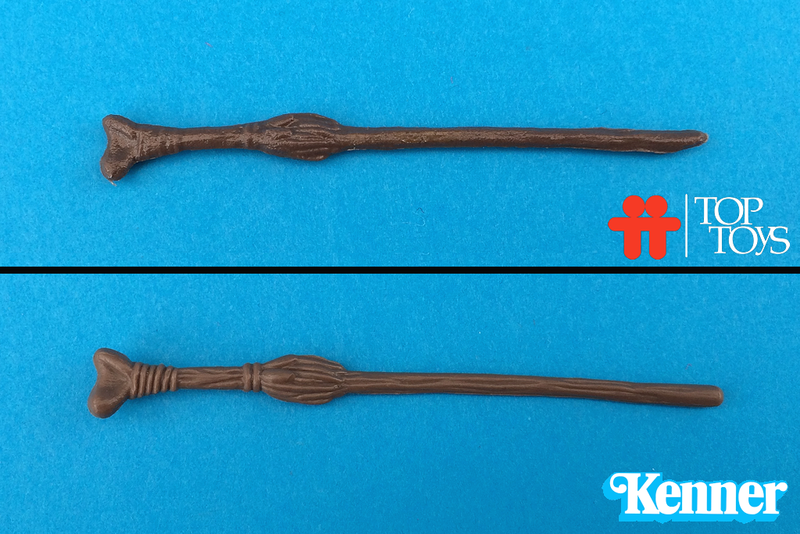 Behold, mortals, the superior castings from Top Toys!